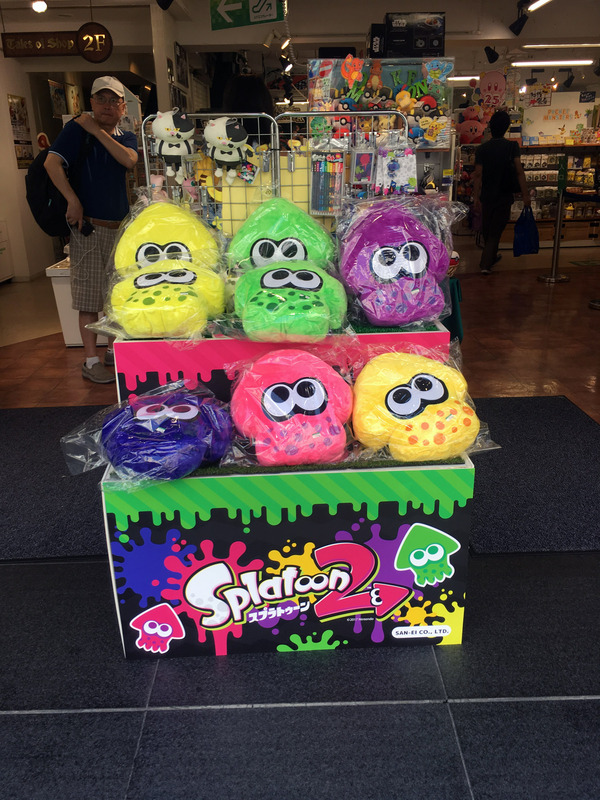 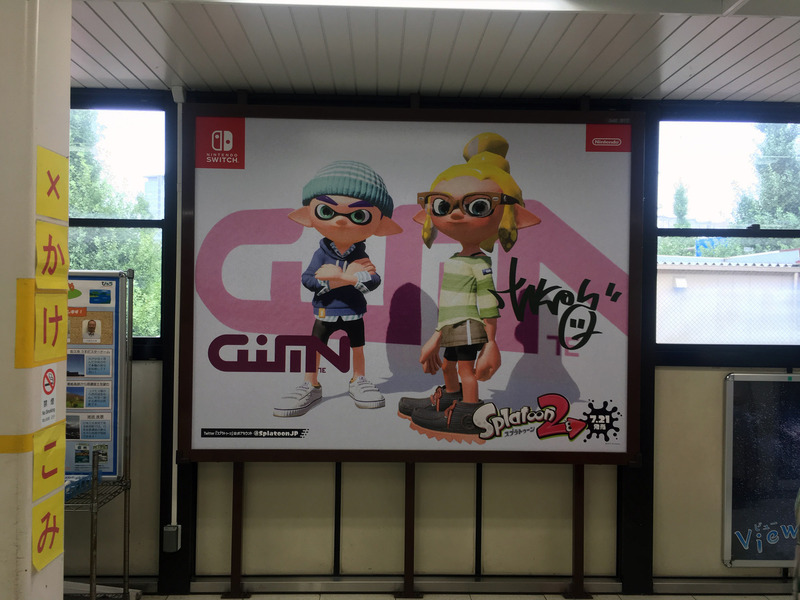 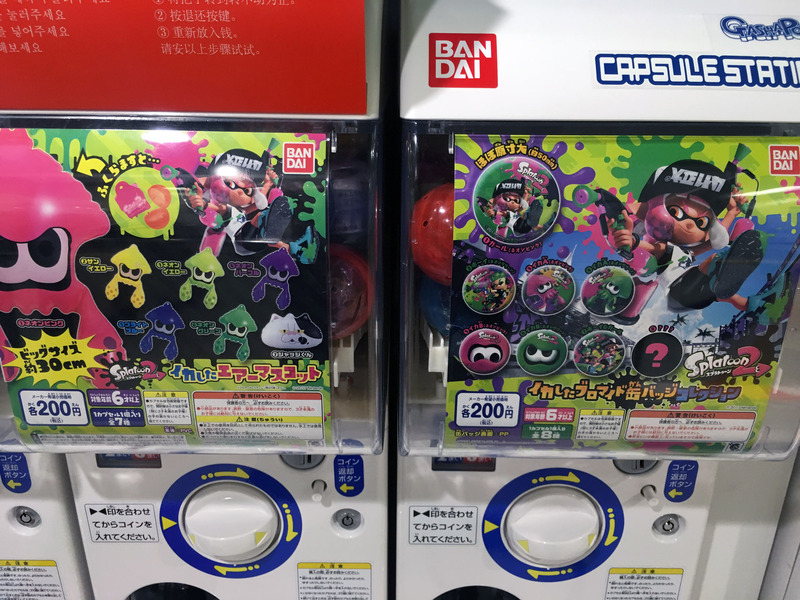 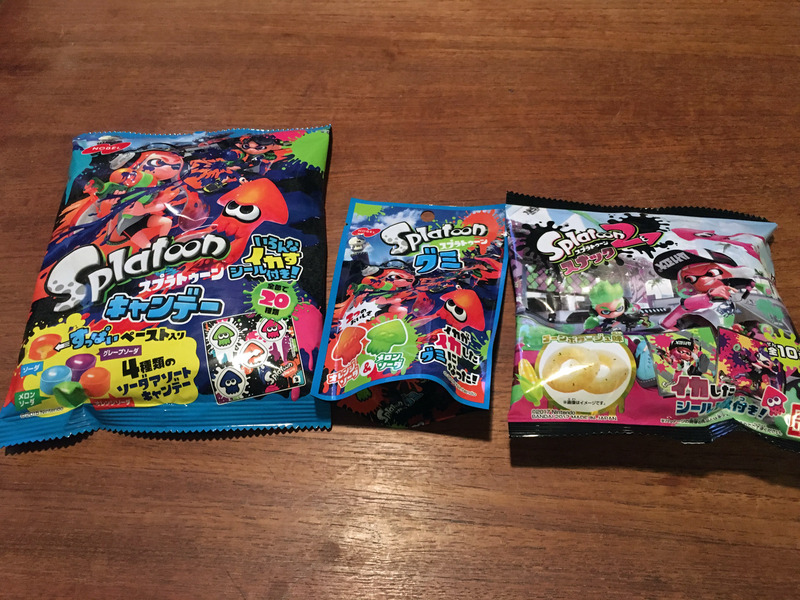 Splatoon – Nintendo Sega Japan! 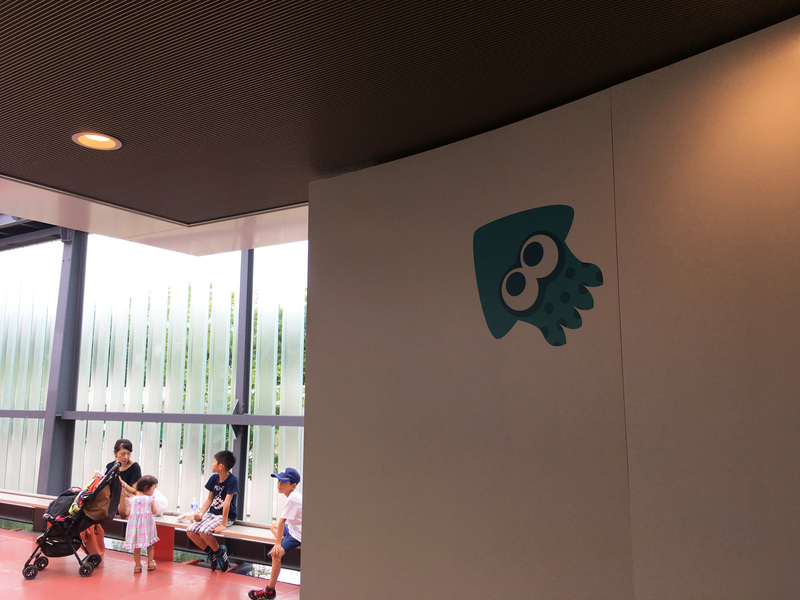 The final stop in the ‘Splatoon madness’ journey is in Nintendo’s home town, at Kyoto Aquarium. 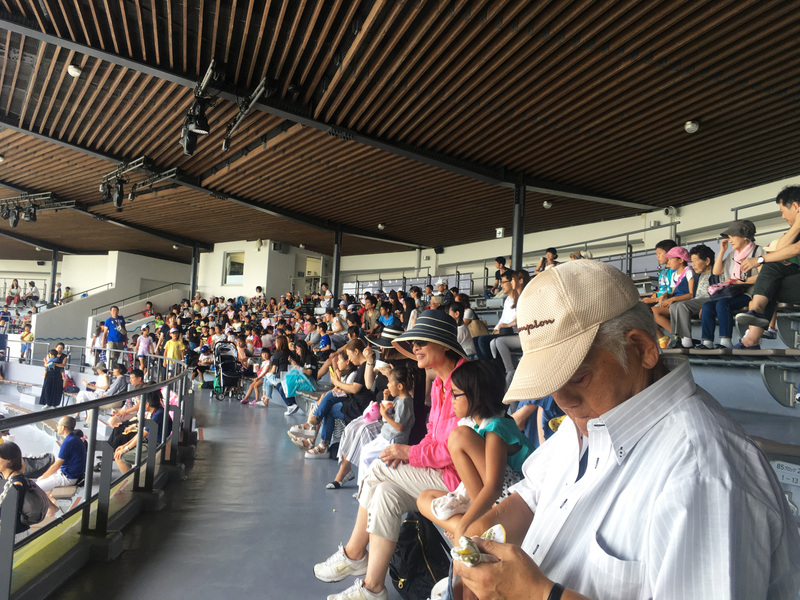 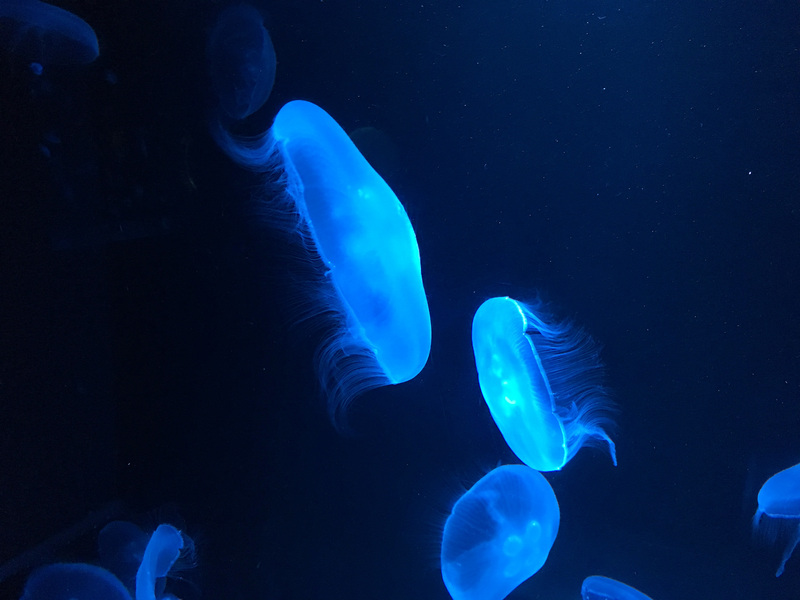 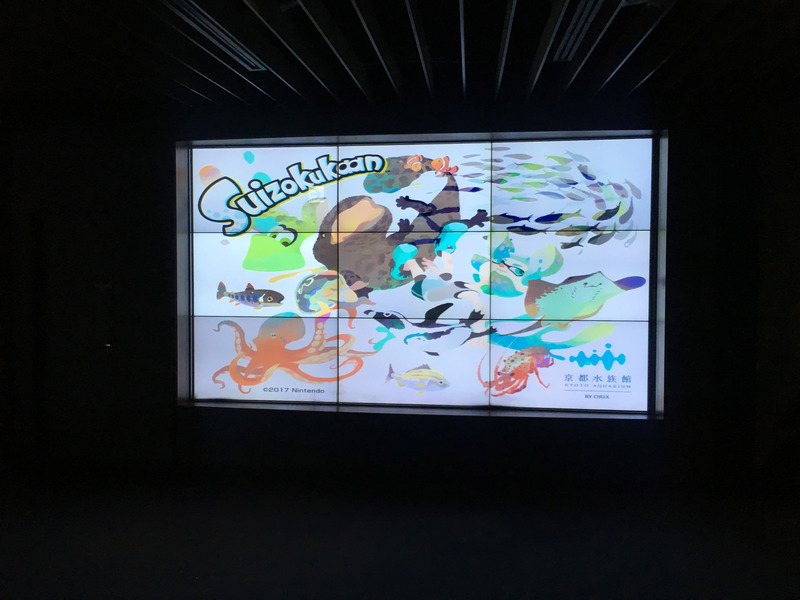 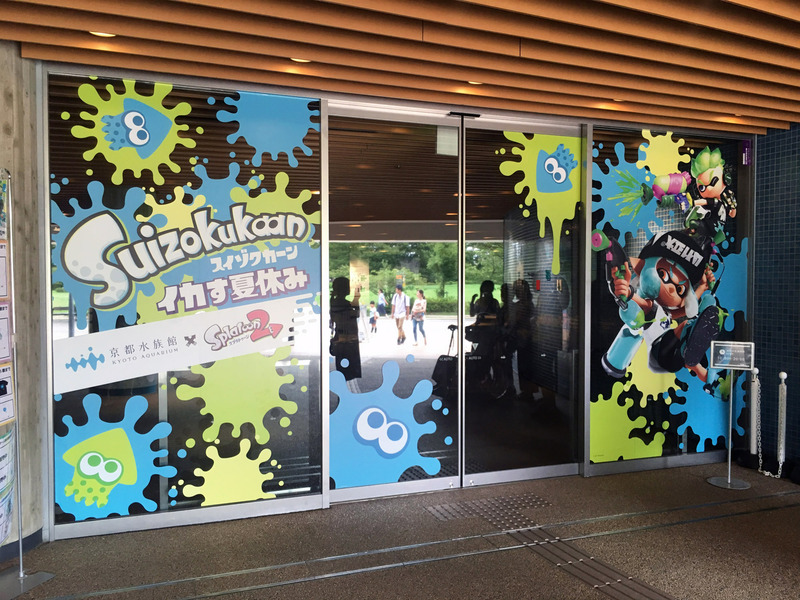 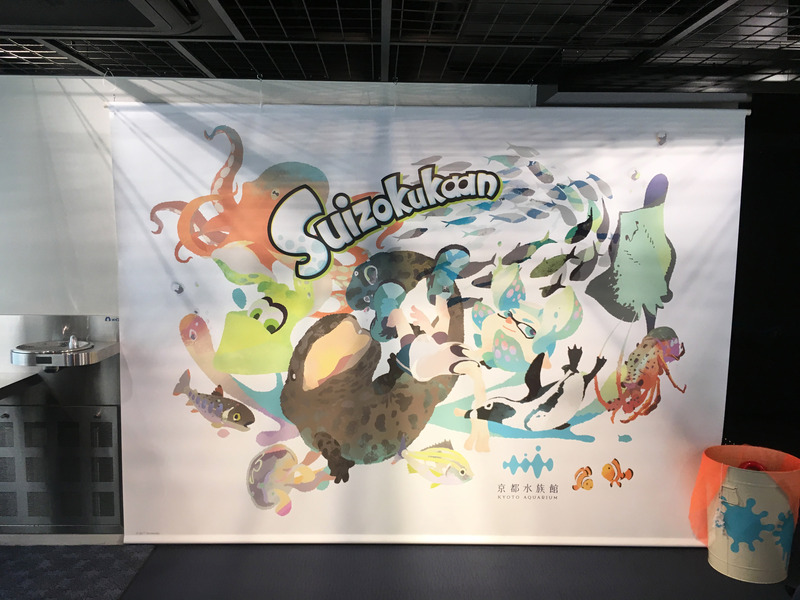 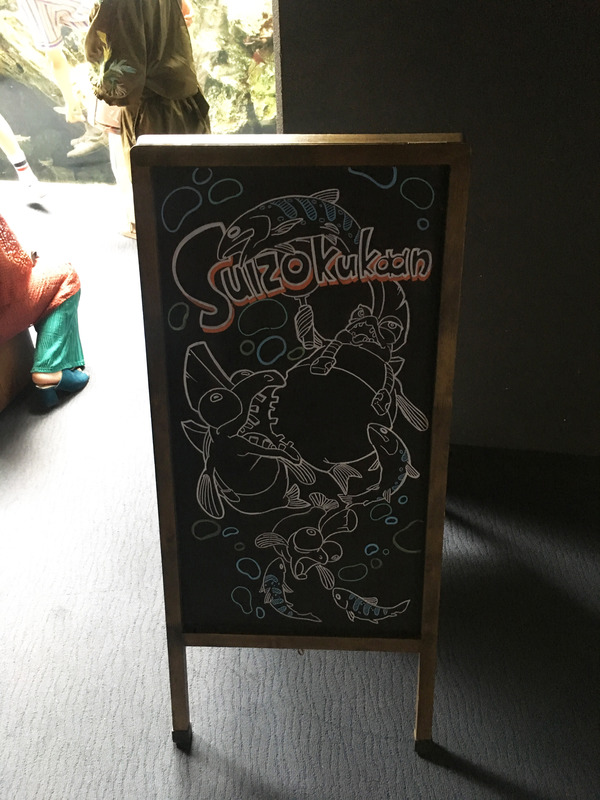 A semi-educational Splatoon-themed event called ‘Suizokukaan’ ran for summer, with a focus on squid and jellyfish exhibits. 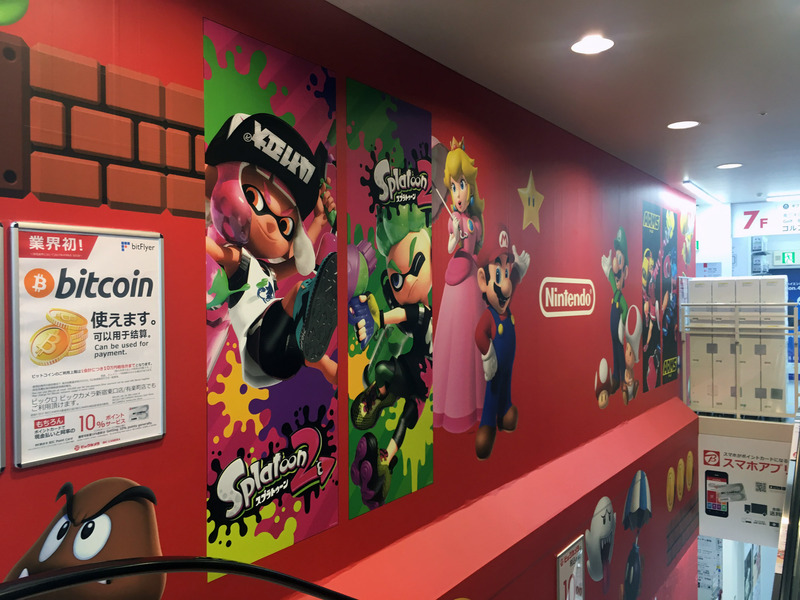 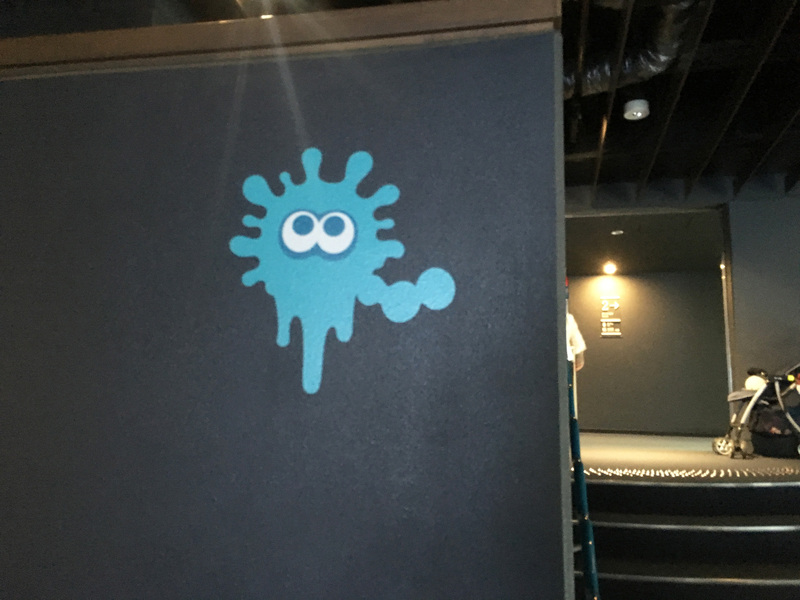 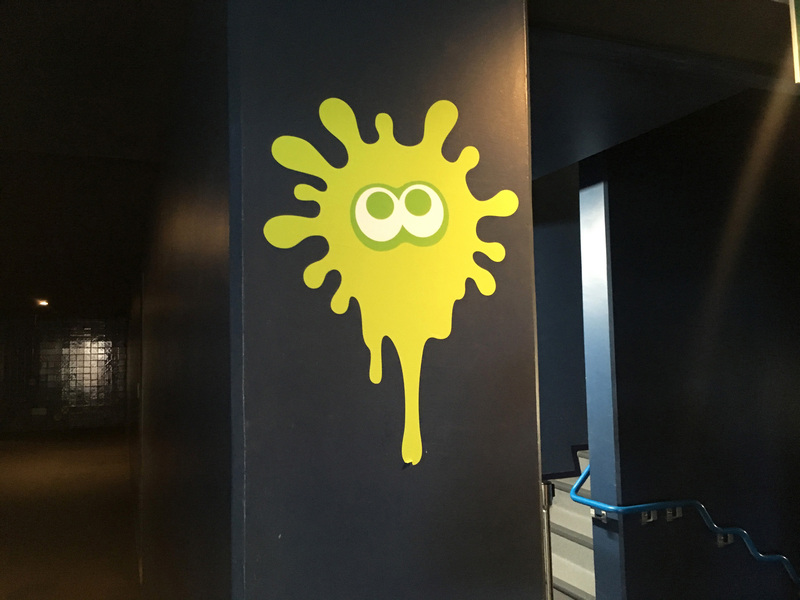 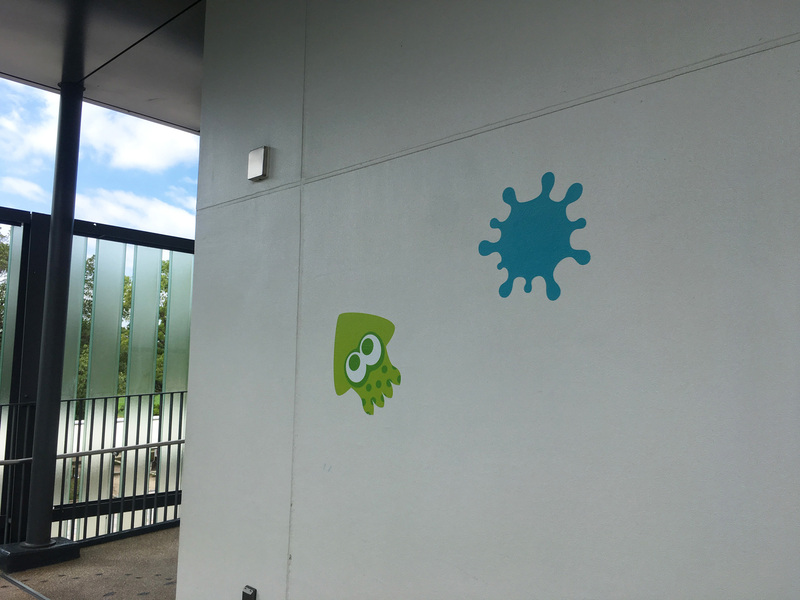 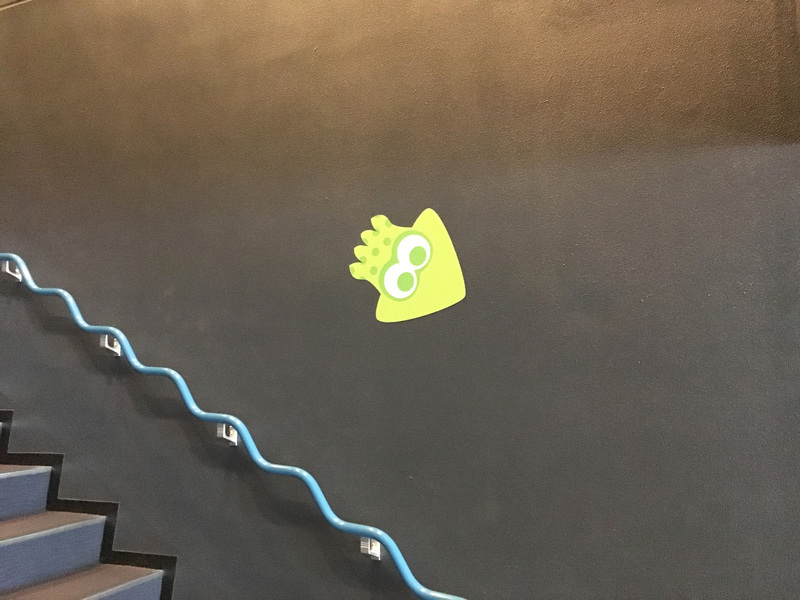 The aquarium was outfitted with Splatoon branding throughout. 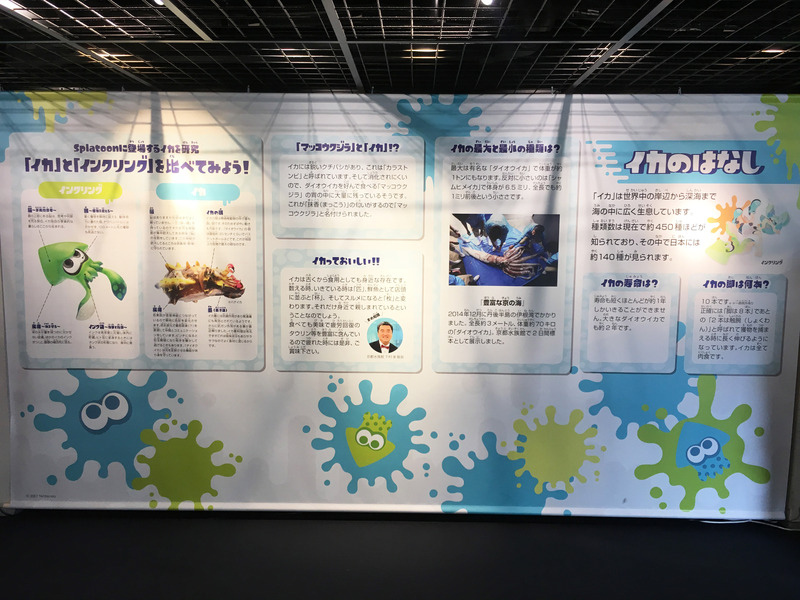 And featured special Splatoon art as temporary signs for each relevant section. 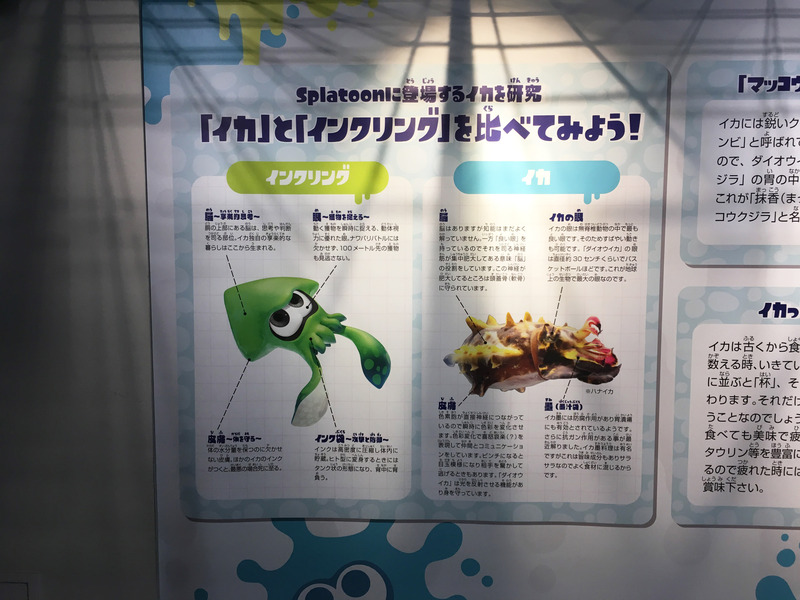 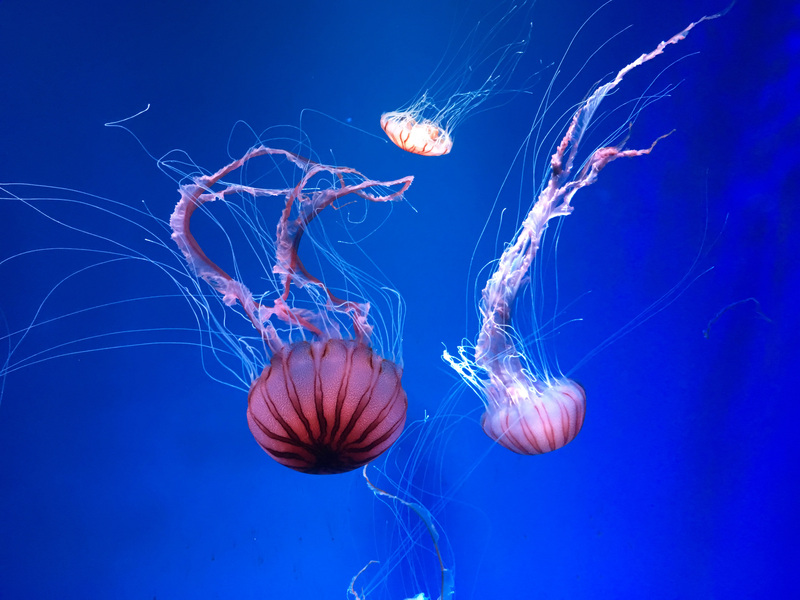 The educational info compared what’s seen in the game with the actual marine life. 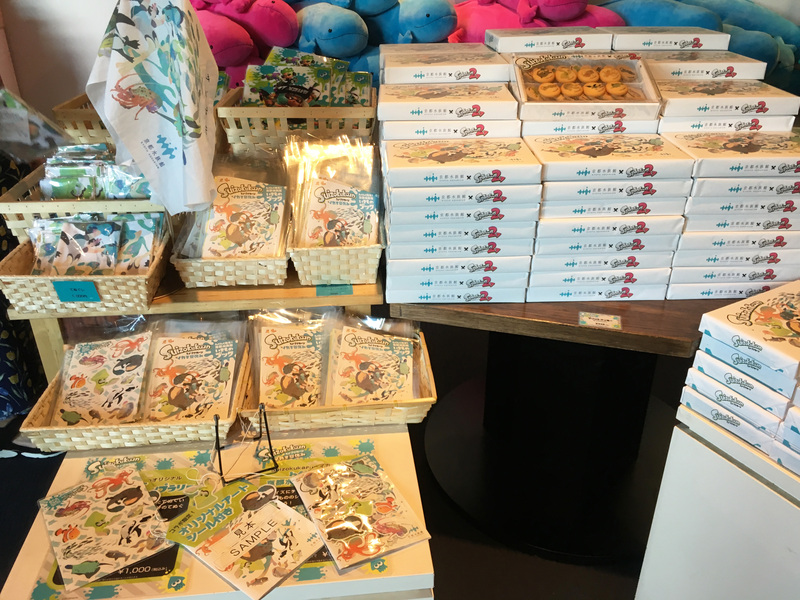 And what would a tourist trap be without copious volumes of exclusive merchandise! 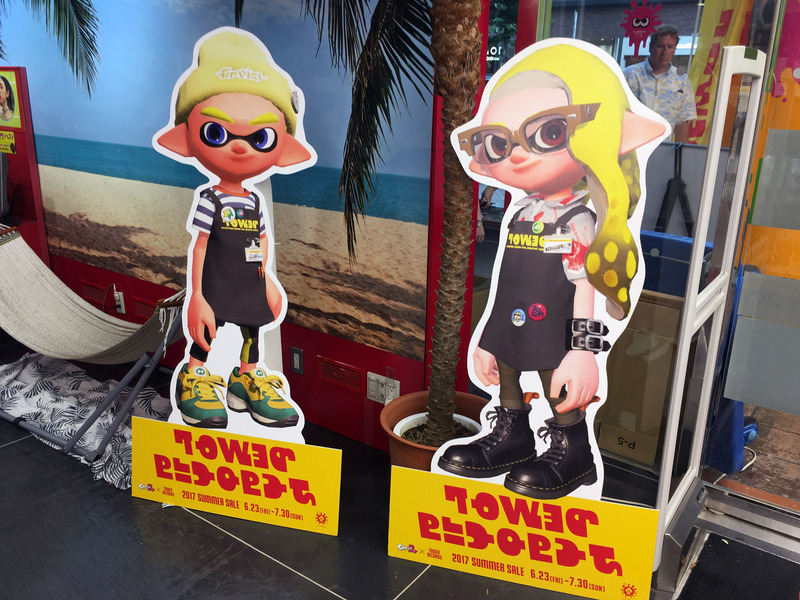 Murch would be proud. 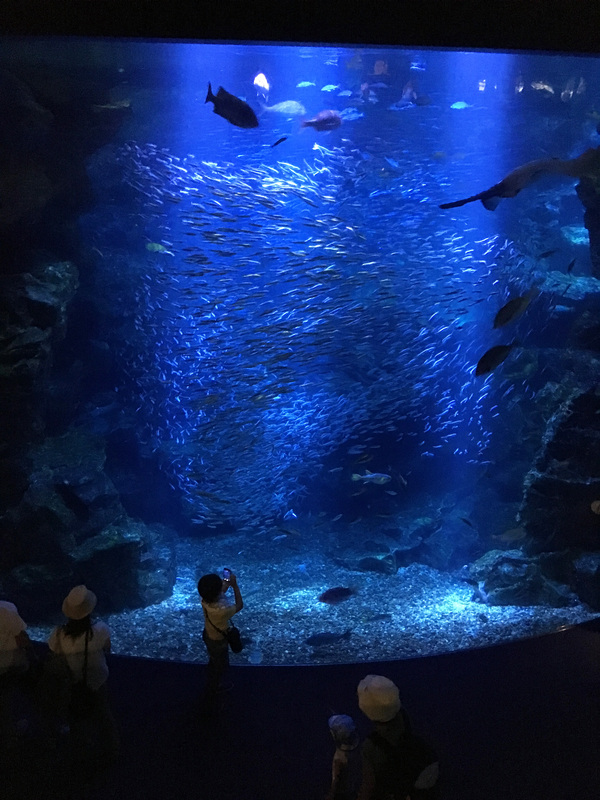 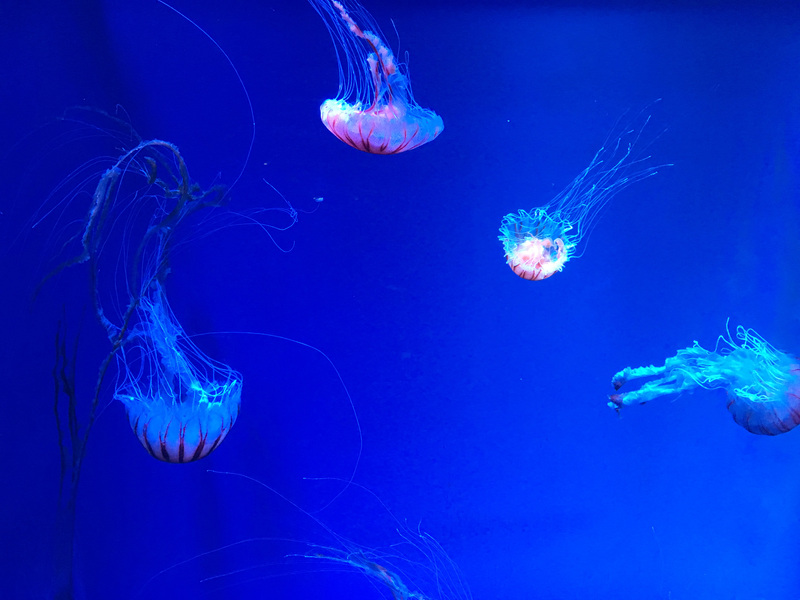 The aquarium itself is pretty standard stuff, but quite modern with some nice exhibits. 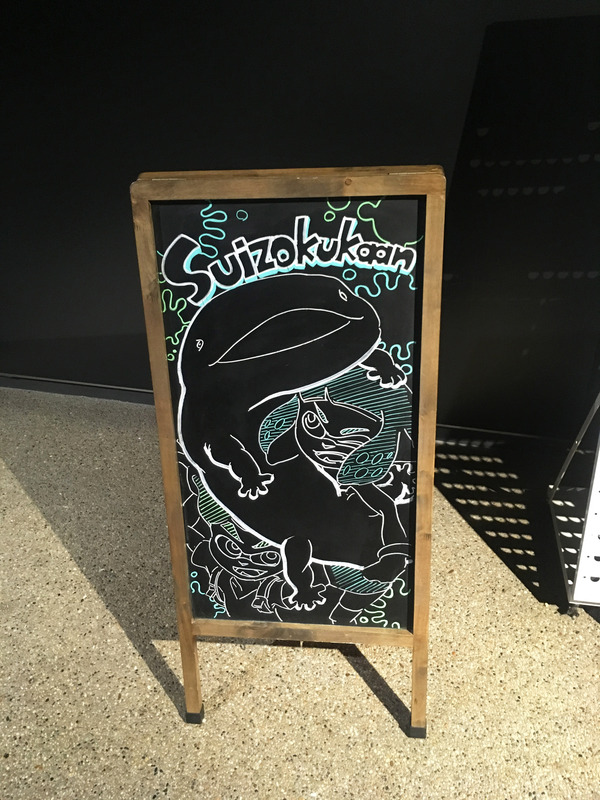 There are some cute Japanese touches too. 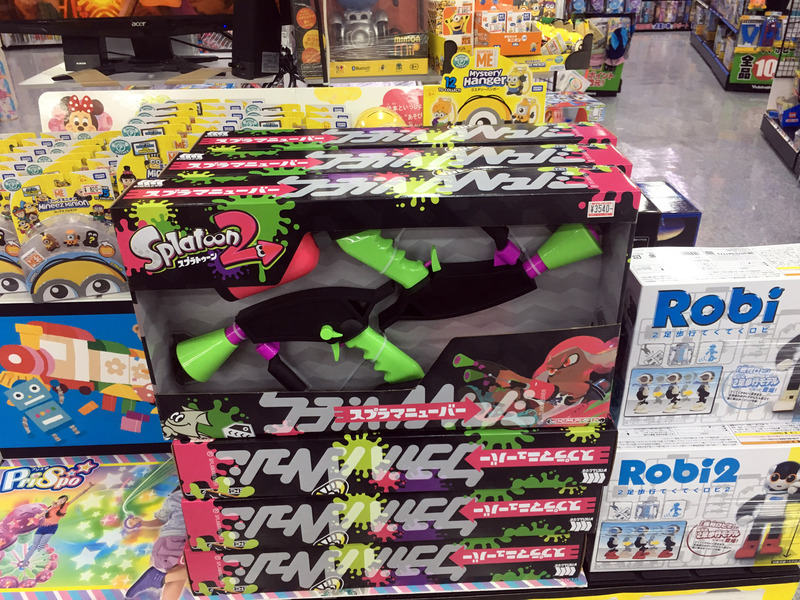 And shoot water at a squid target. 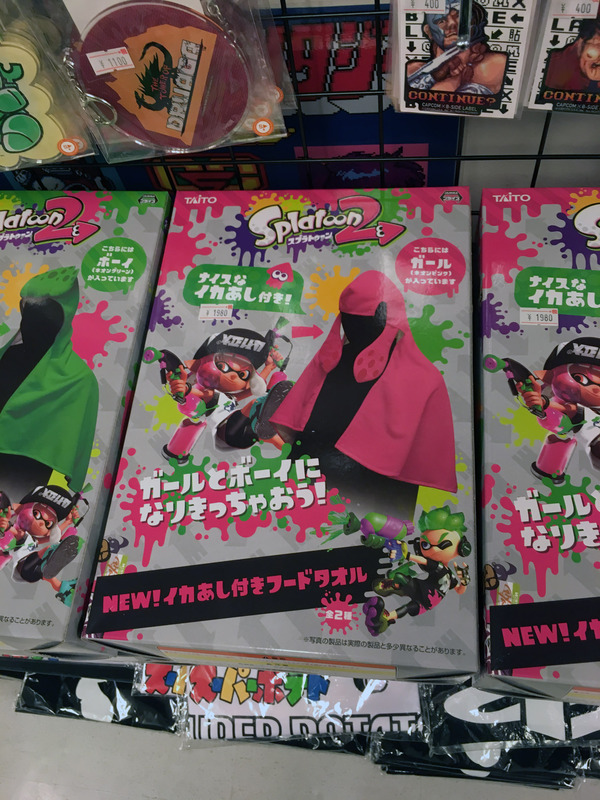 It’s a competition for who can hit the highest level, green vs pink. 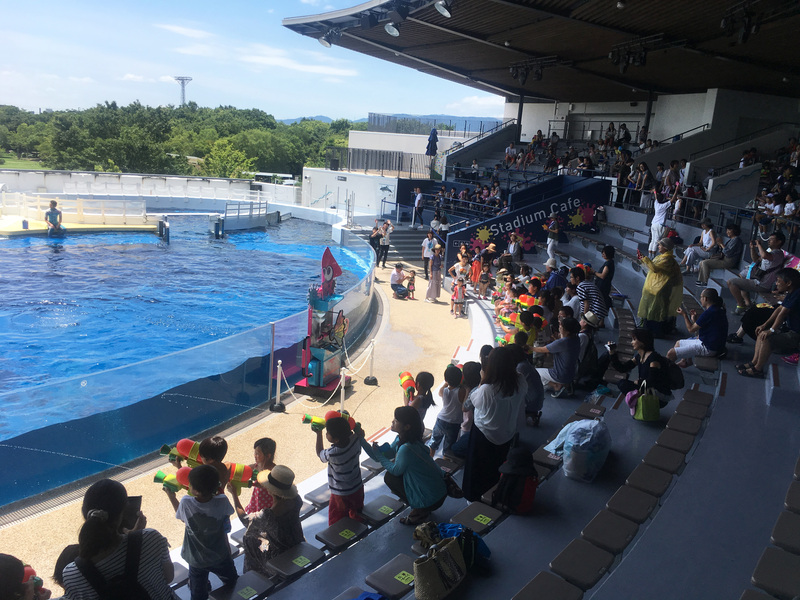 While parents/grandparents/people waiting for the seal show look on in various states of amusement/boredom. 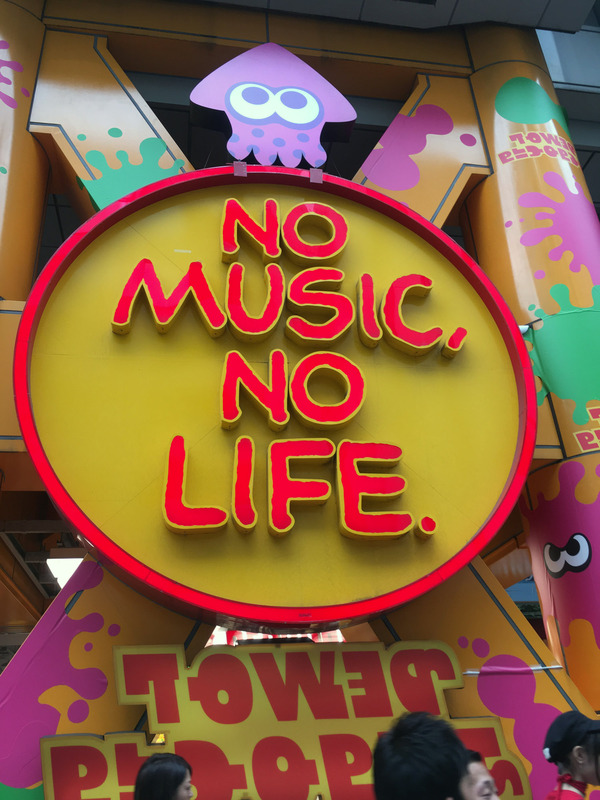 The best part is the music. 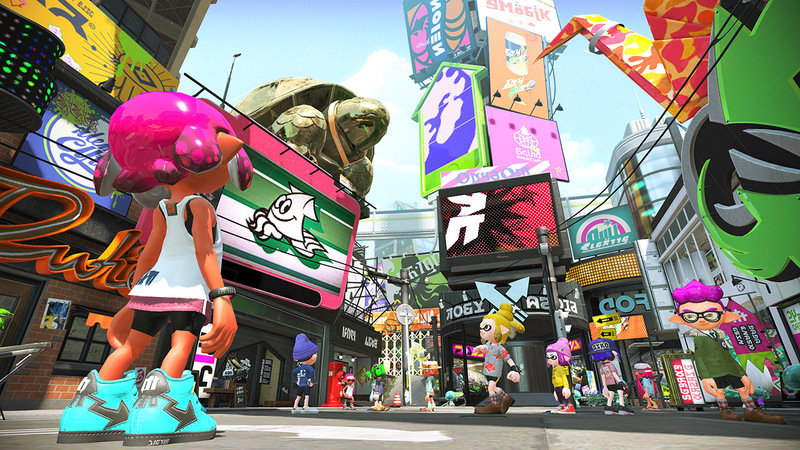 Tracks from the first game play while the race is on. 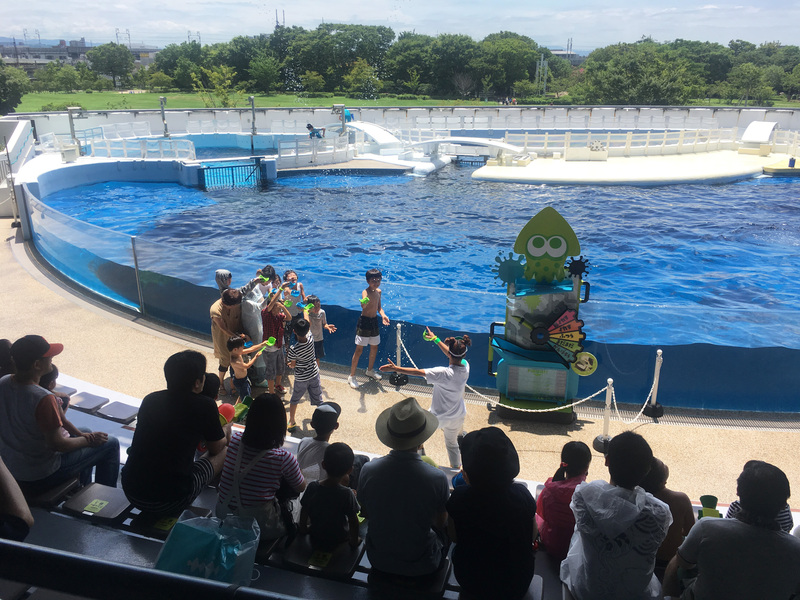 And right at the end they drop a waterfall on all the participants to the tune of ‘Now or Never’ – Squid Squad version. 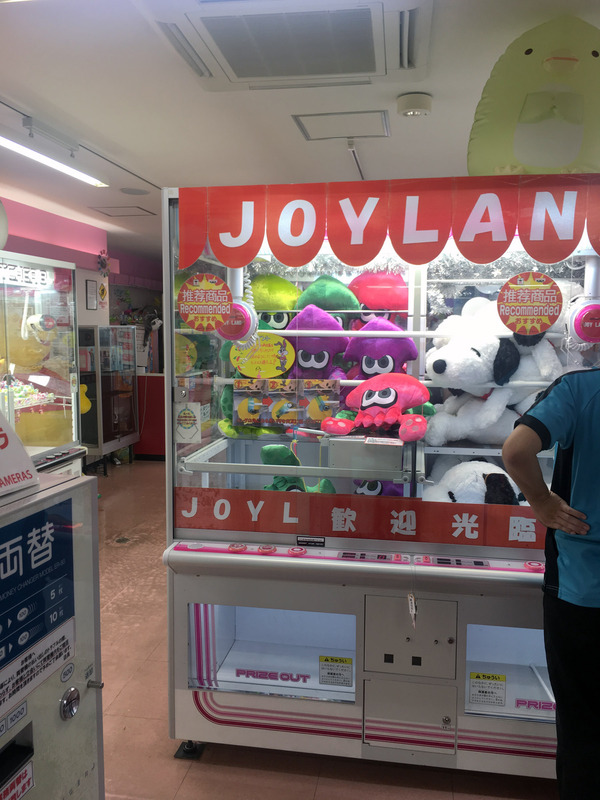 All a very silly diversion but fun for the kids. 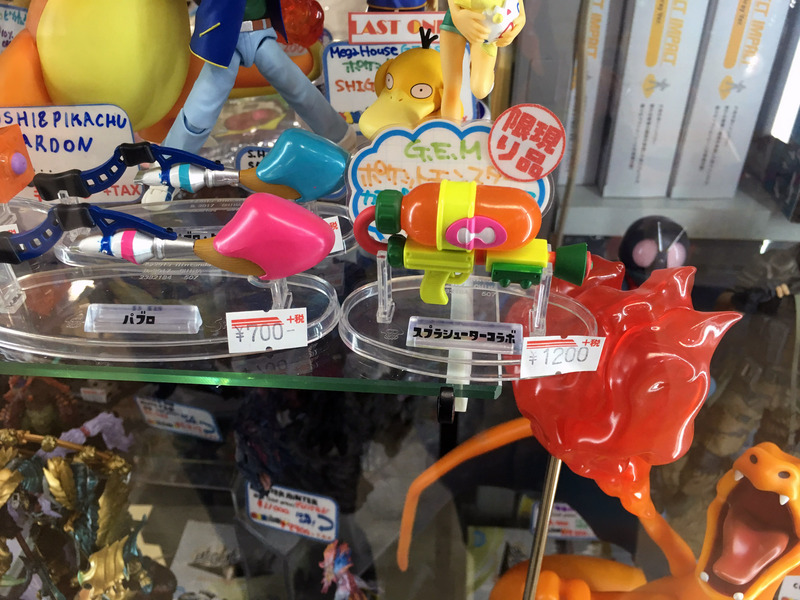 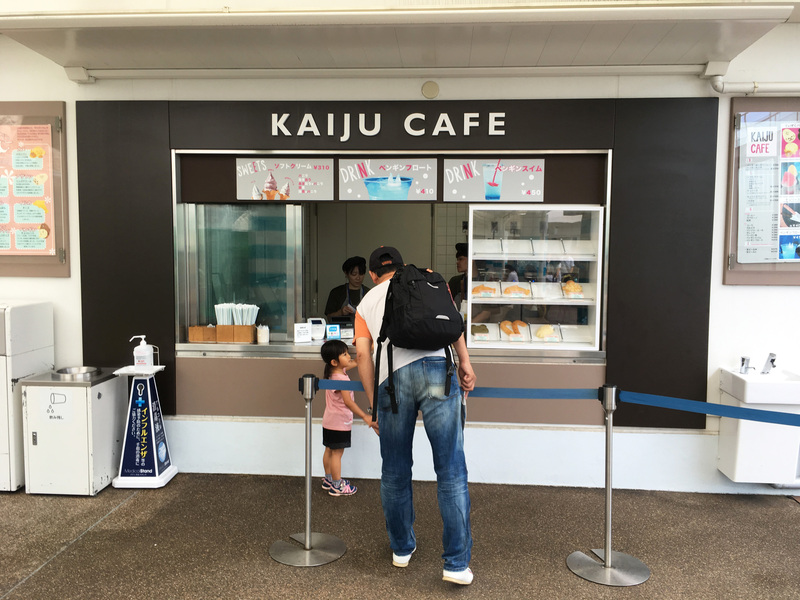 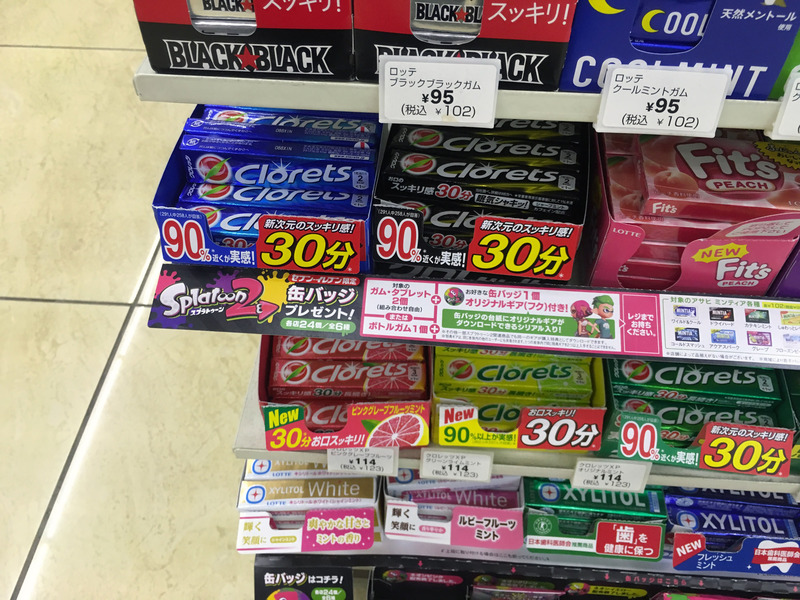 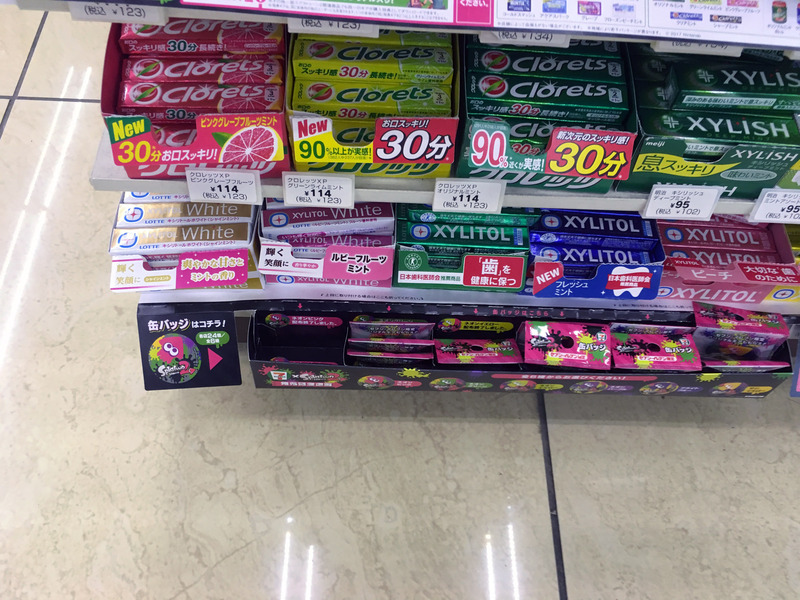 And just shows the depth of the cultural relevance of the brand in Japan. 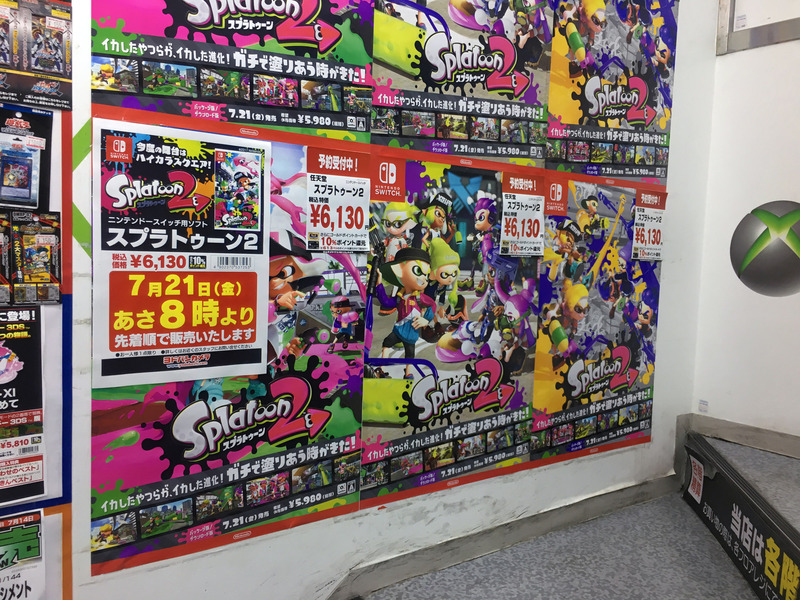 Splatoon 2 launched on a Friday, so most people were at work. 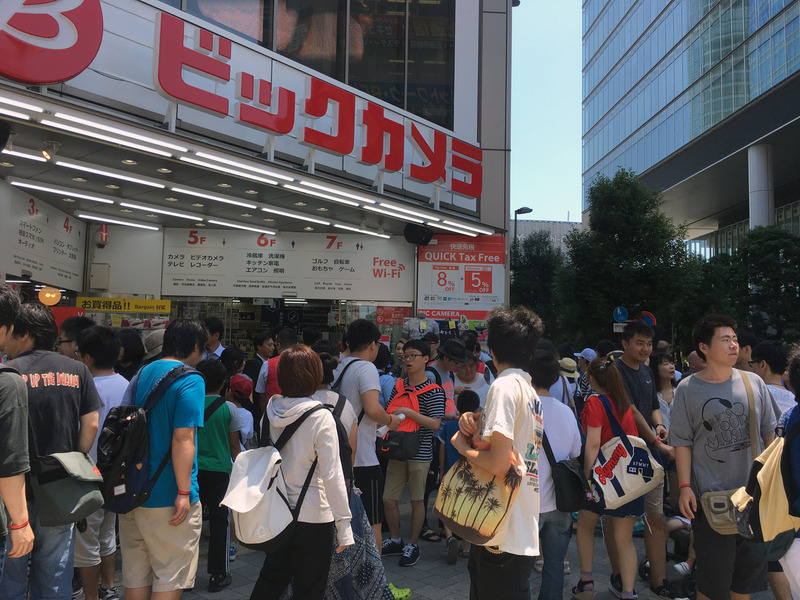 Shops in Akihabara open at 10am, and many were ready for early buyers. 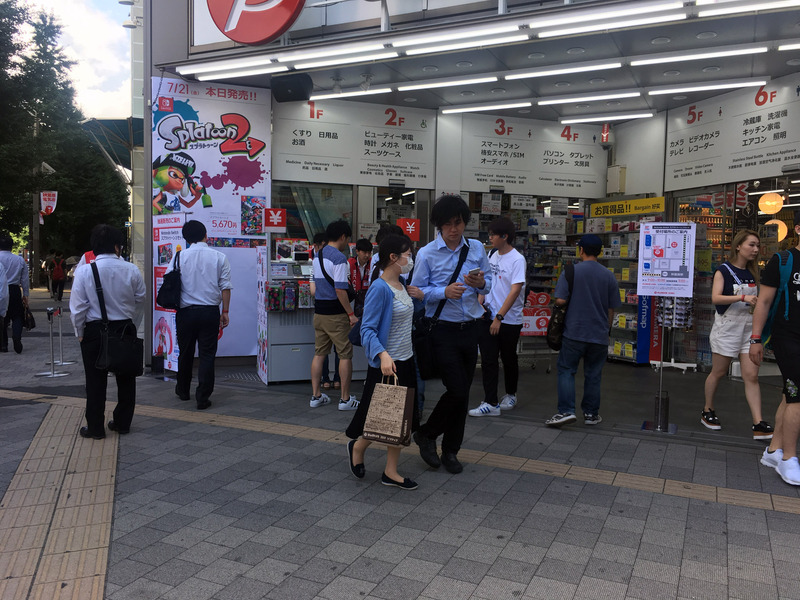 Some larger stores like Sofmap, Bic Camera and Yodobashi Camera set up shopfront stalls, selling the game and related products. 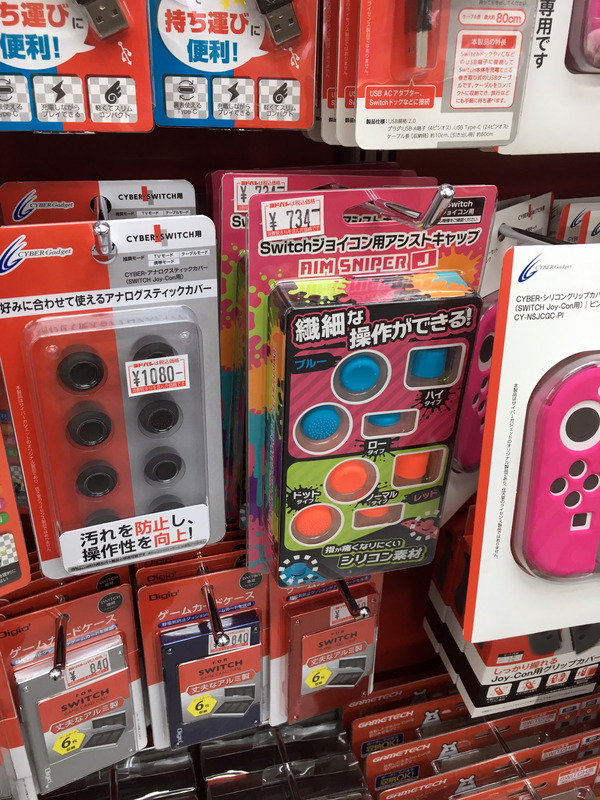 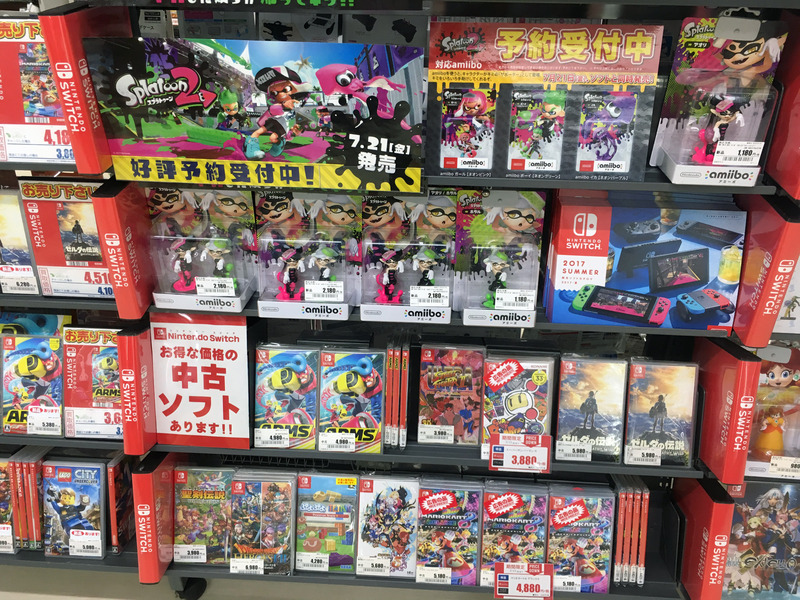 But there was plenty of stock to go around, so it was easy enough to get the game and related items, like Amiibo and neon green/pink joycons. 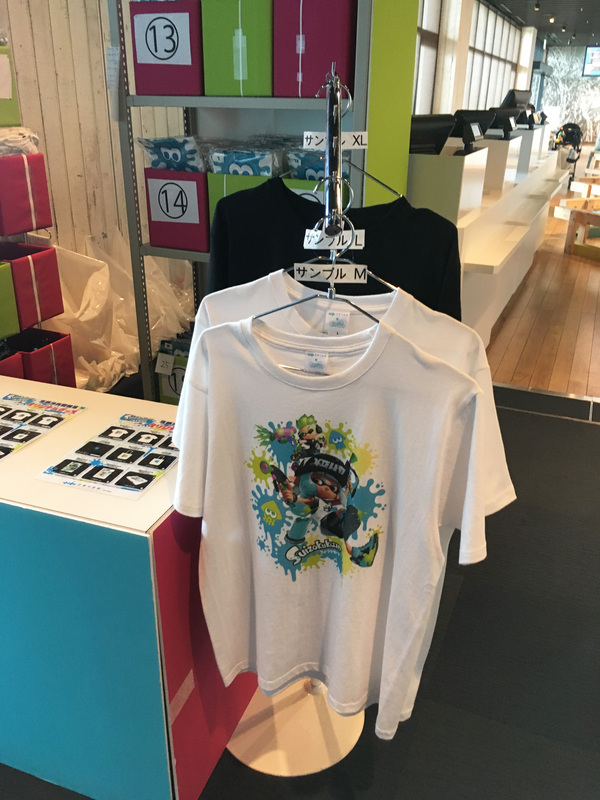 If you were lucky, there were also a few of the licensed (in-game brand) Forge headsets available. 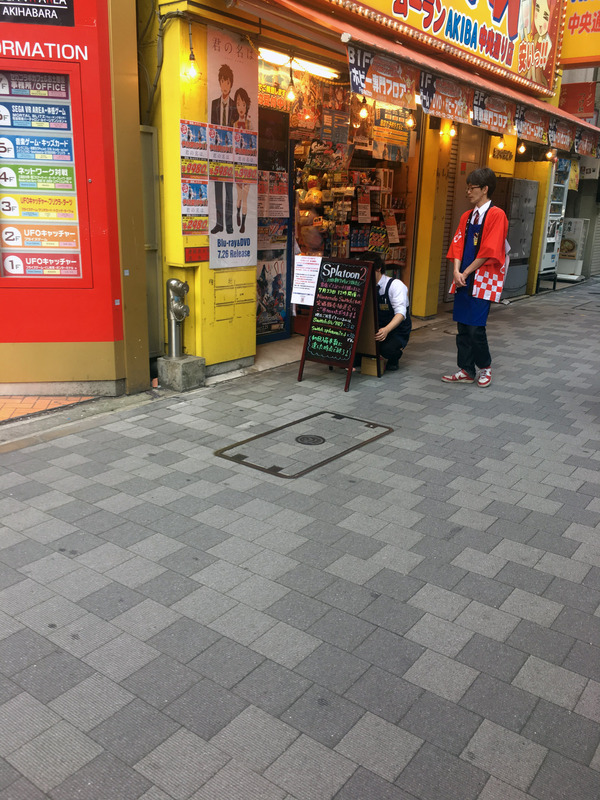 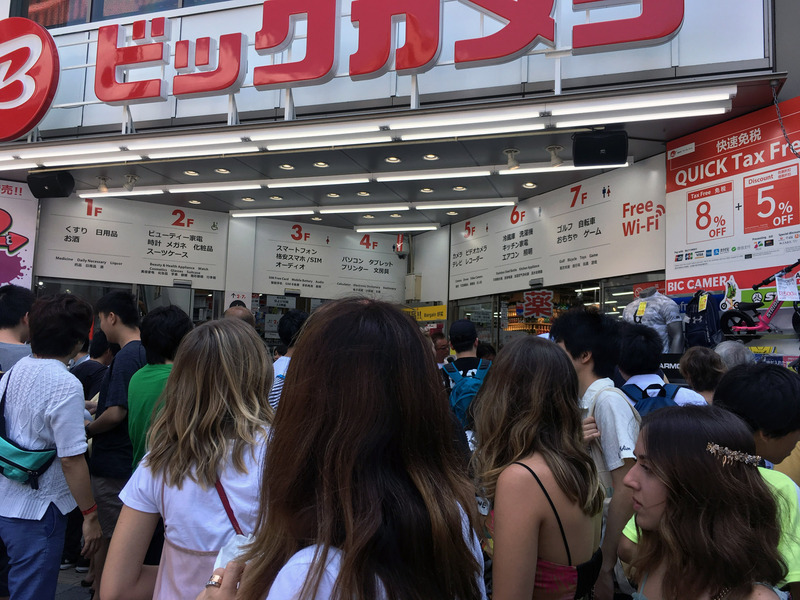 The bigger stores were very busy however – there was a 20+ minute wait at the counter at Yodobashi for example. 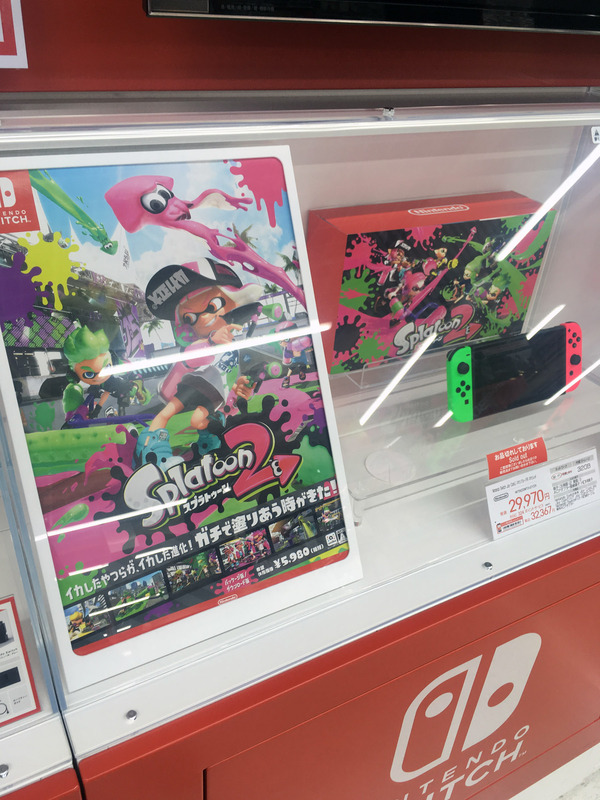 Demand is off the charts and all Switch consoles sell out instantly. 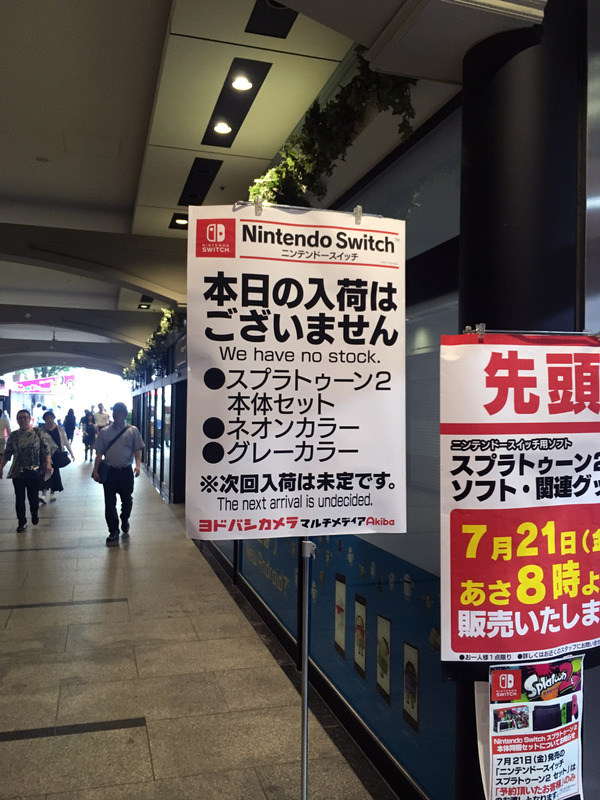 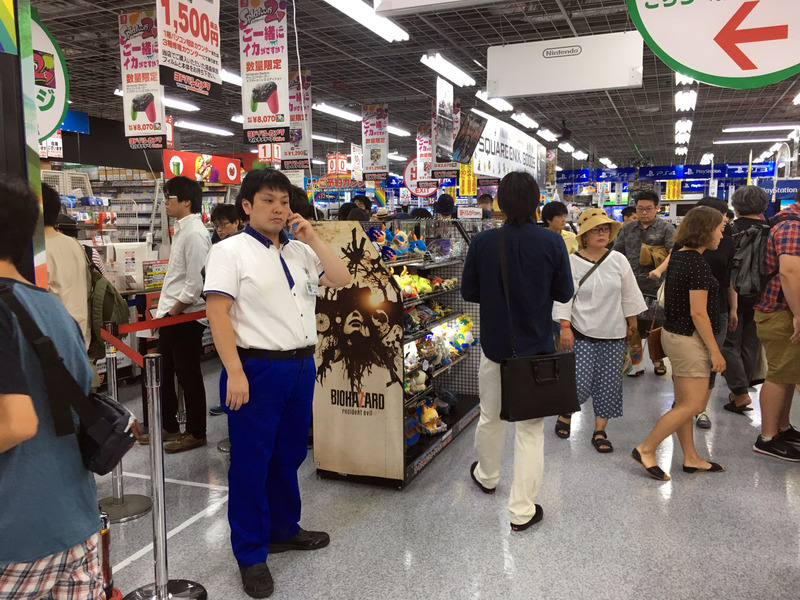 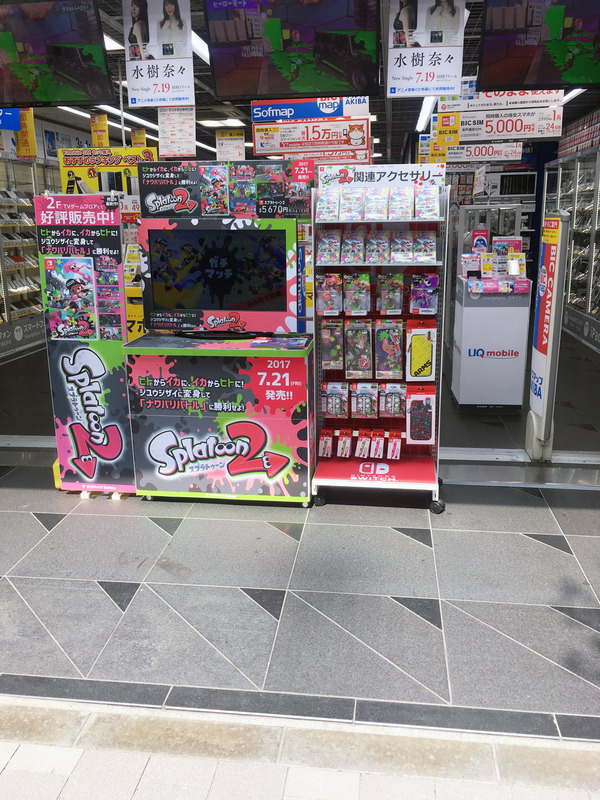 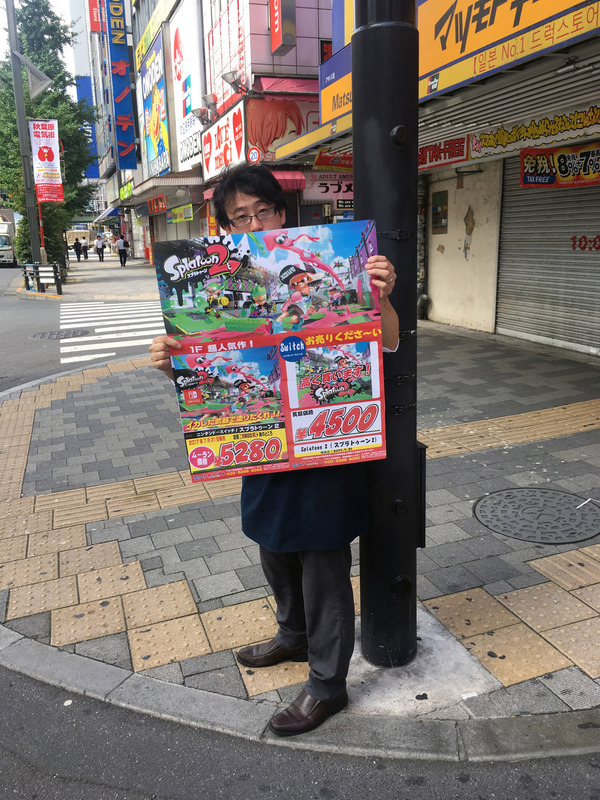 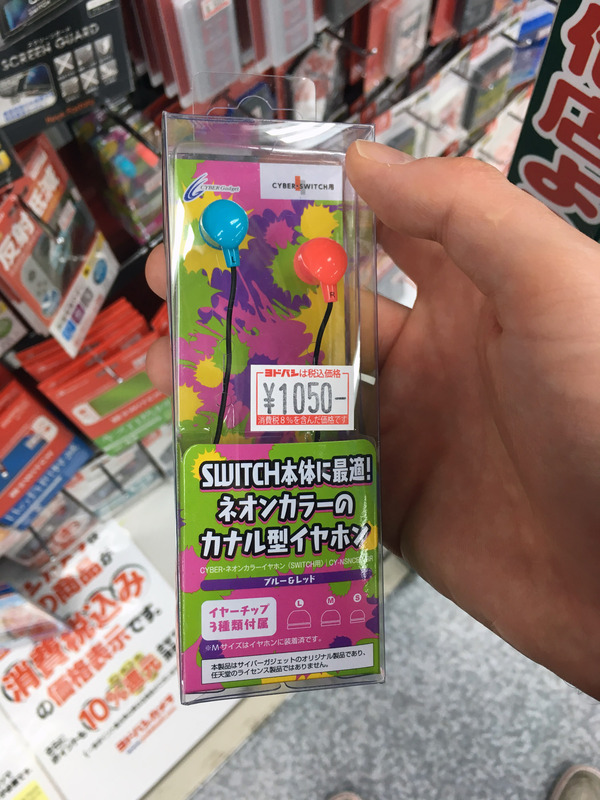 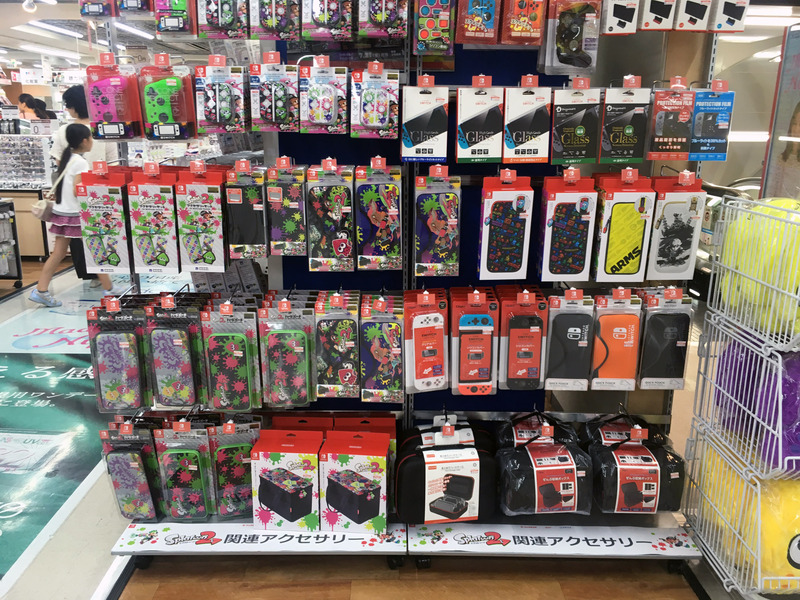 Stores only get a certain allotment of consoles, and to determine which customers get a chance to buy one, they run lotteries. 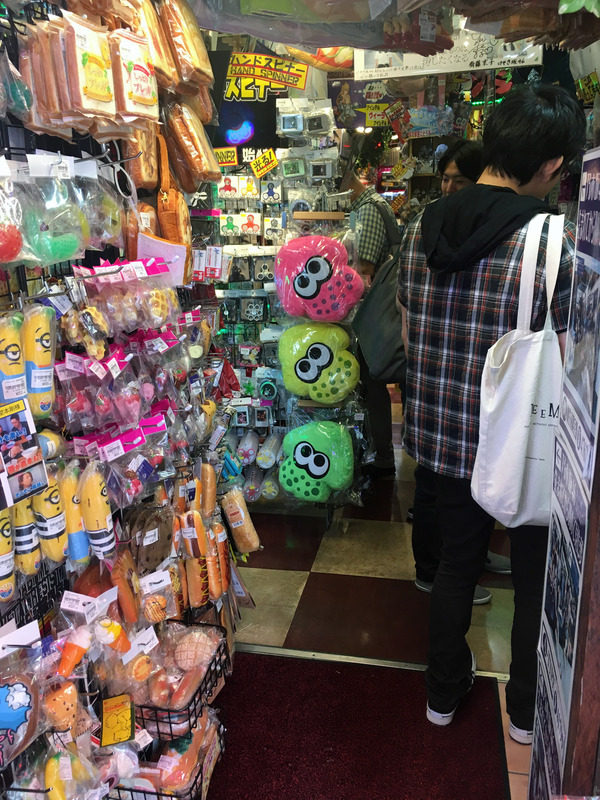 Literal lotteries. 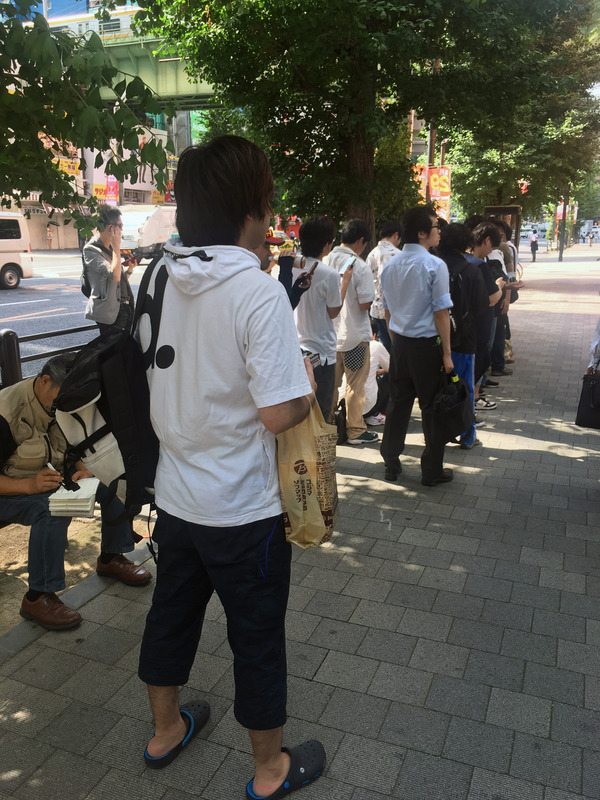 Customers are asked to line up at a certain location from 8am and take a number. 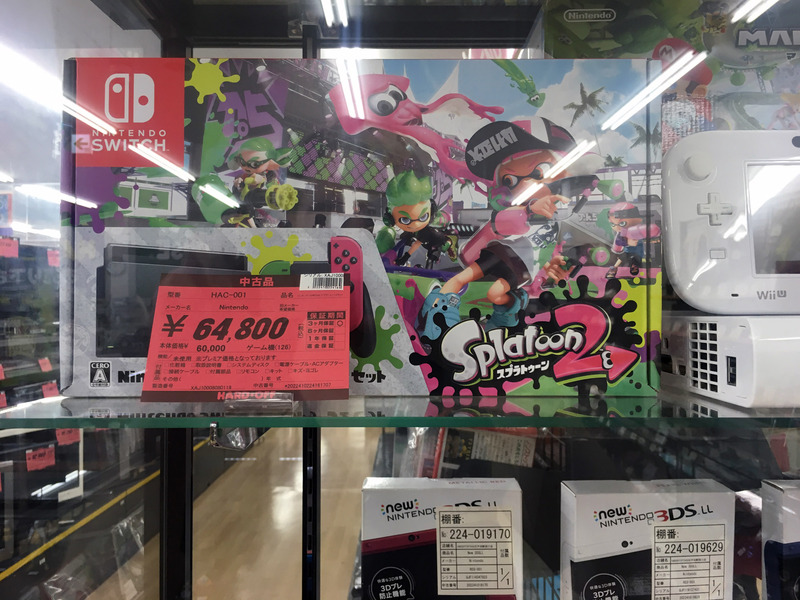 Later in the day, they draw numbers, and the winners now have an opportunity to buy the console. 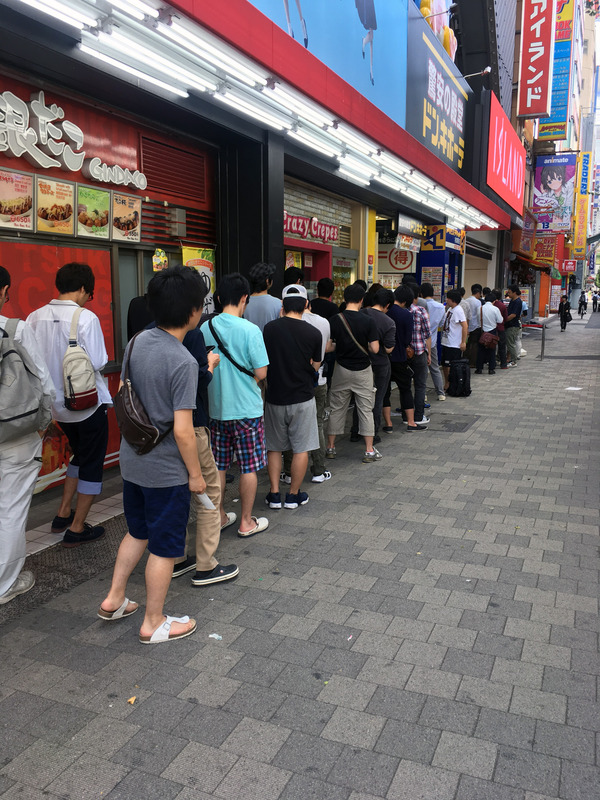 This was the line to take a number at the Akihabara Bic Camera store. 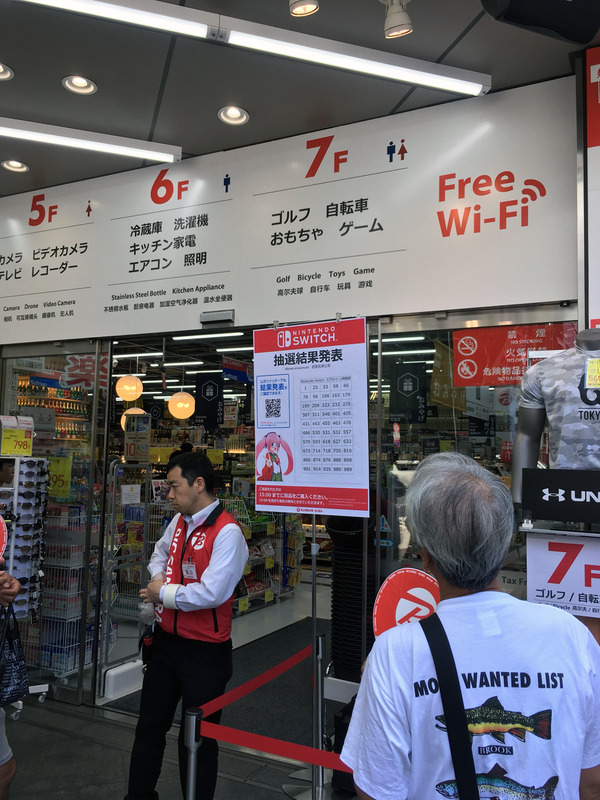 After getting your number, you can go about you day shopping, and return for the results announcement. 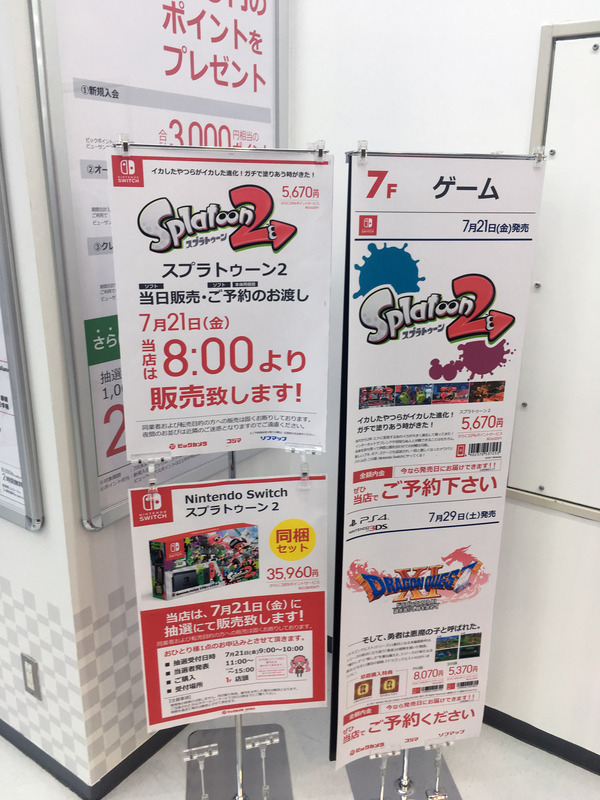 The results are posted at the front of the store. 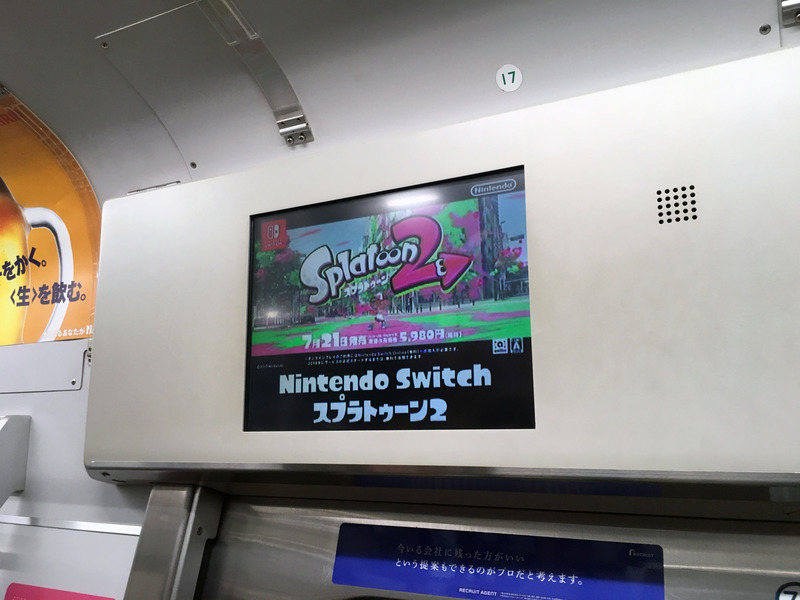 The Splatoon 2 booth was quite busy with buyers at this point, and combined with the rush to see the Switch lottery results, a crush took place. 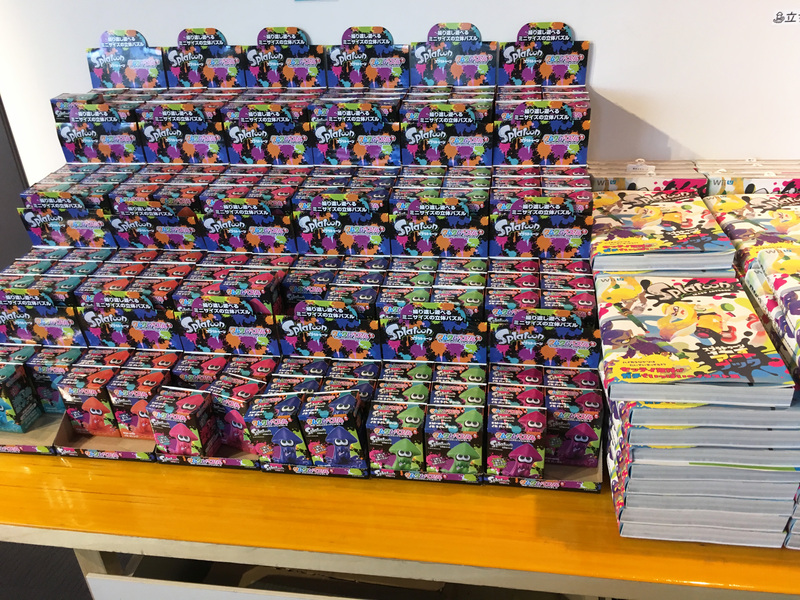 Bad luck if you didn’t win, try again tomorrow. 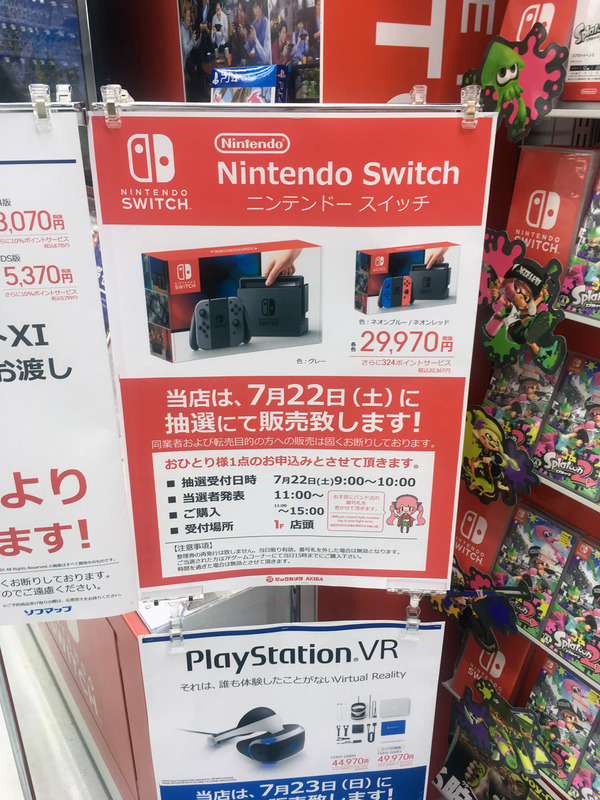 Or you could buy from scalper stores for double the price! 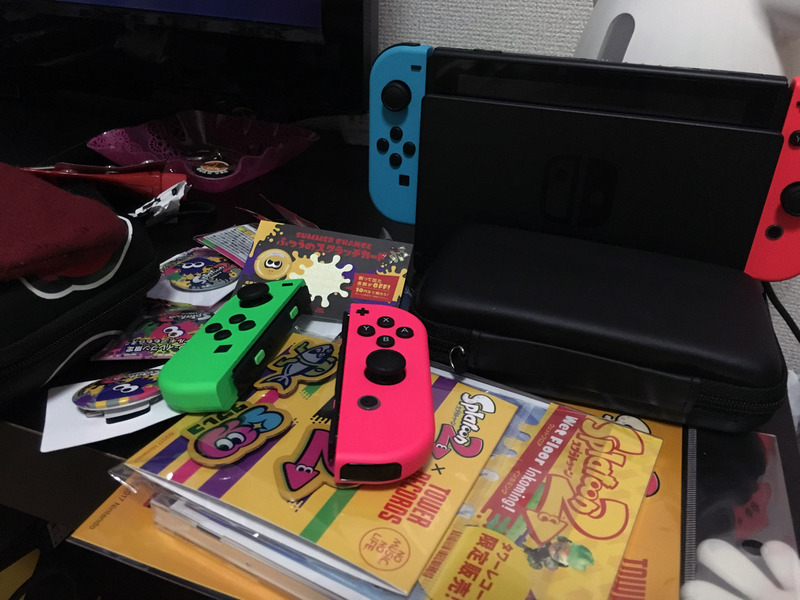 After a long day of observing the craziness, I finally got home to get playing myself. 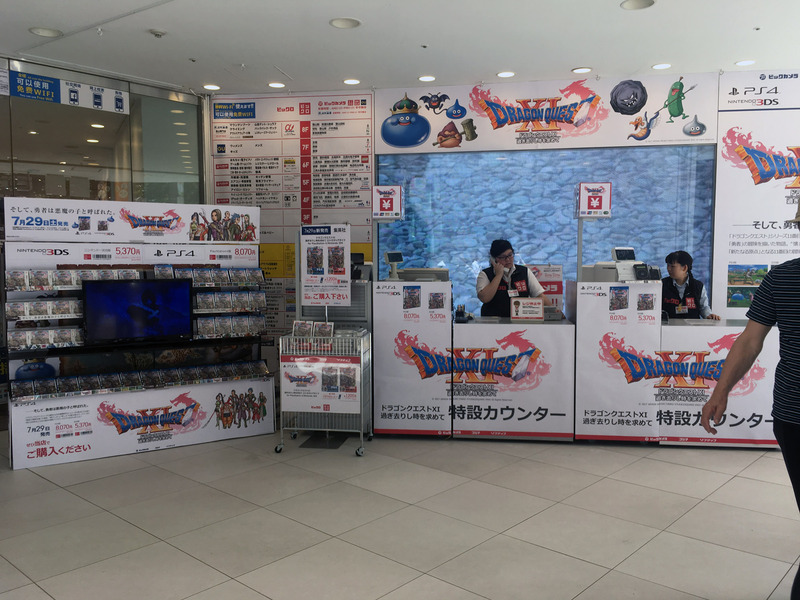 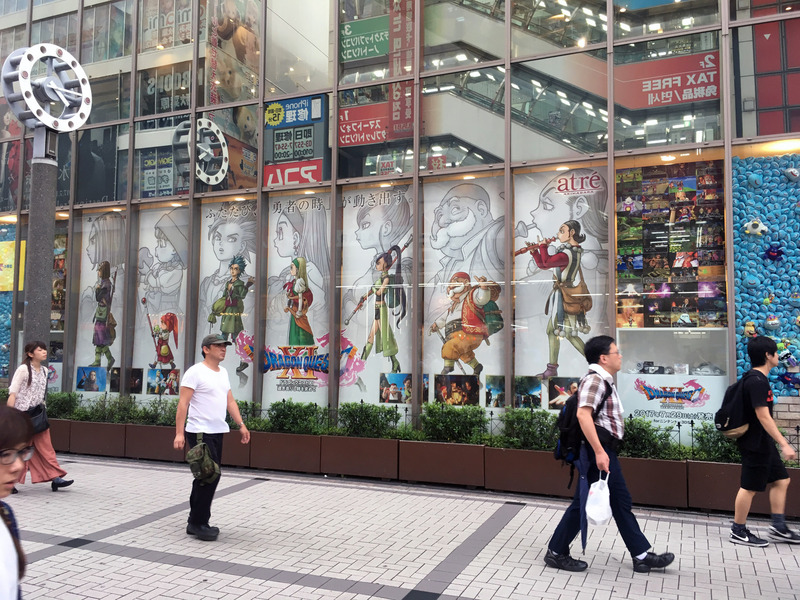 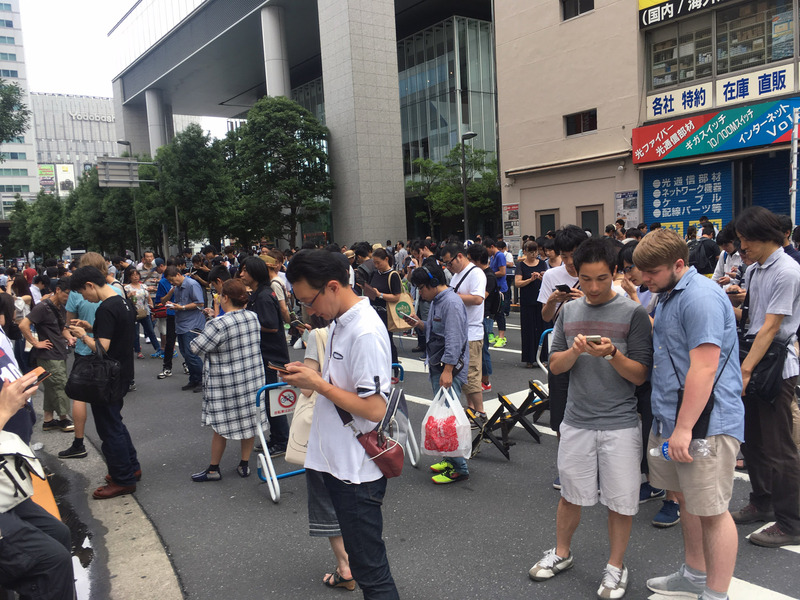 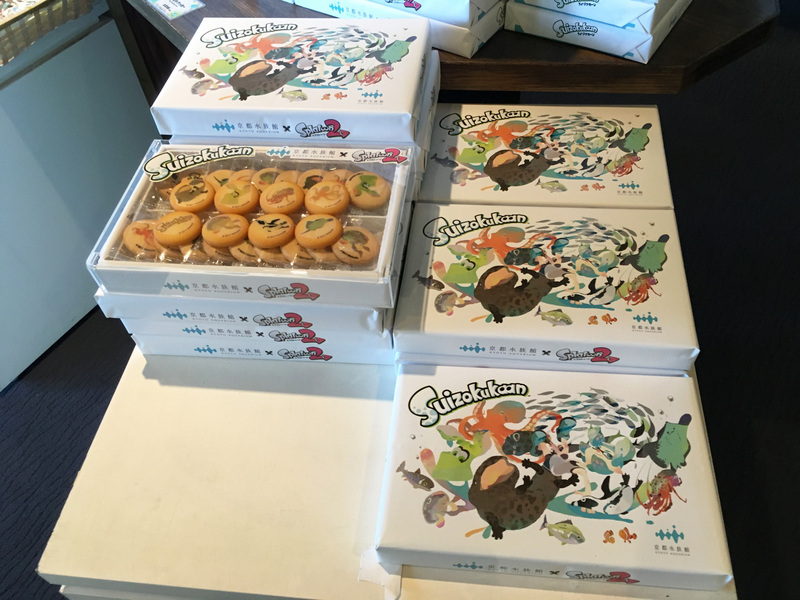 While Japan got ready to do it all again a week later for Dragon Quest XI! 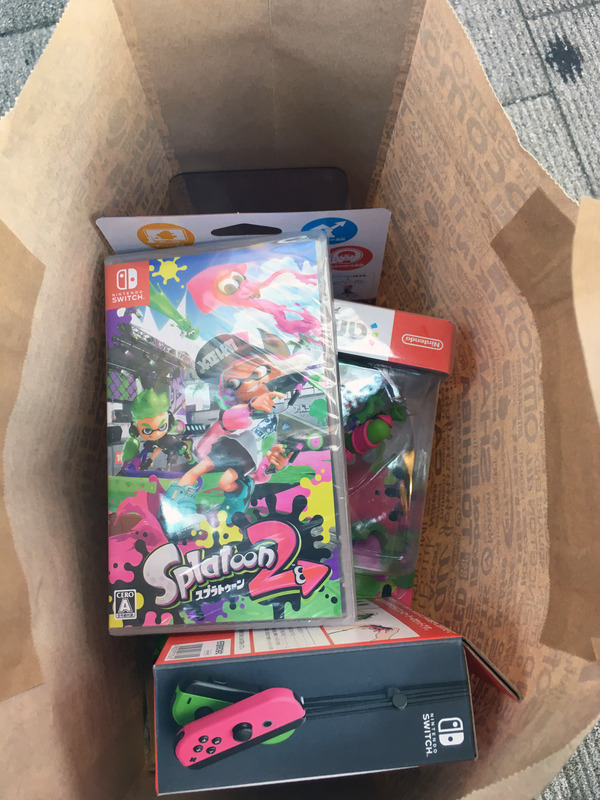 While I mostly focus on retro stuff on this site, I’ve recently gotten back into modern Nintendo games. 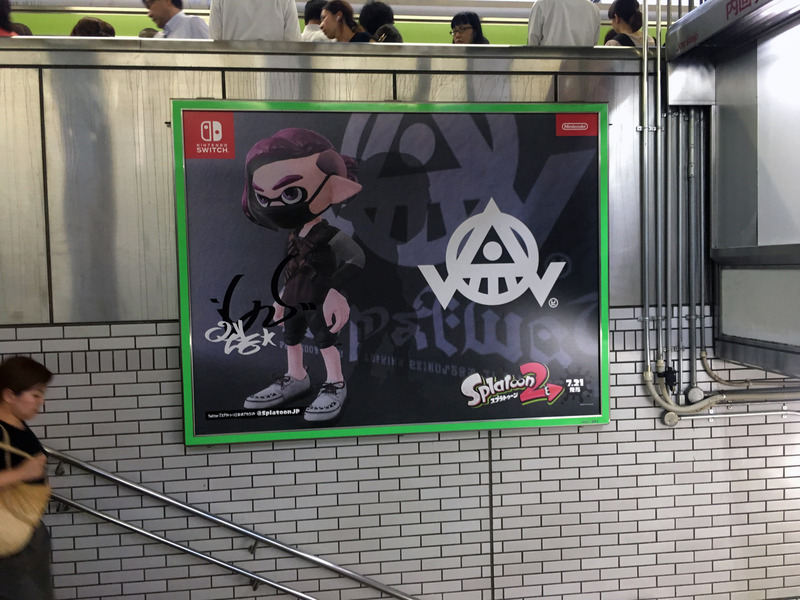 And there is nothing more modern, more Nintendo, and more Japanese than Splatoon, a game about punk-rock fashion-conscious highly evolved transforming squid children playing ink-shooting games in a post-apocalyptic future world. 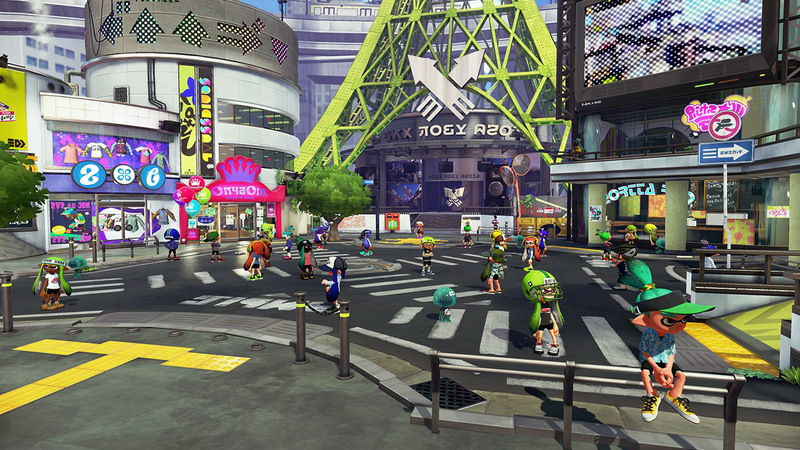 Oh, and it features singing idol girls and is set in a suspiciously Shinjuku/Harajuku looking city. 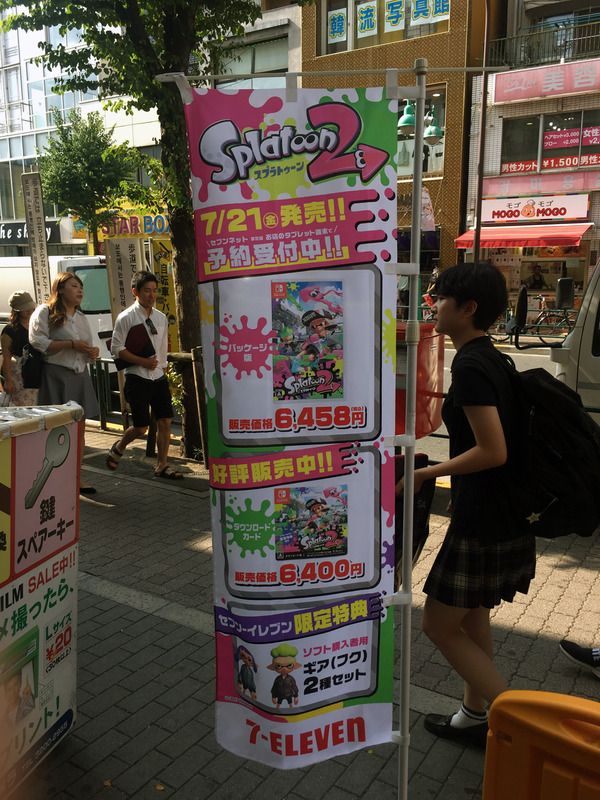 The first Splatoon was huge in Japan, despite the fact the console it was released on, the Wii U, was not. 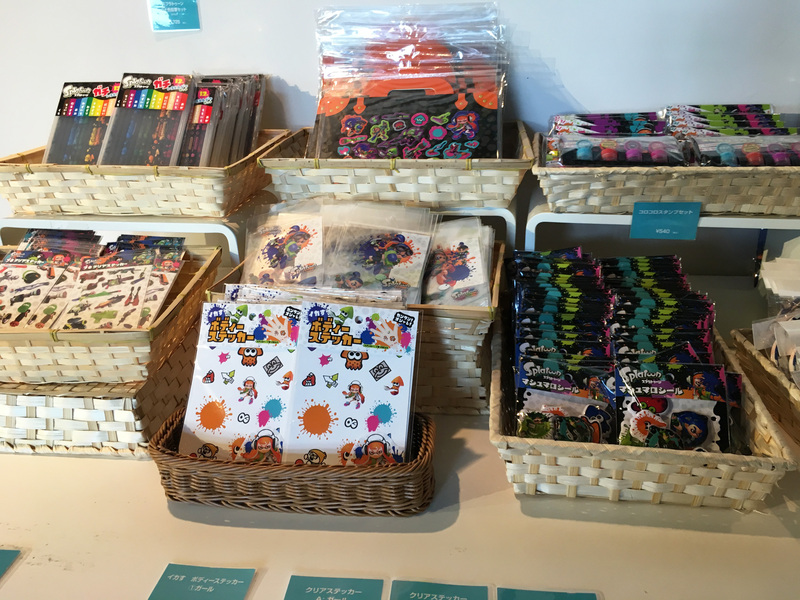 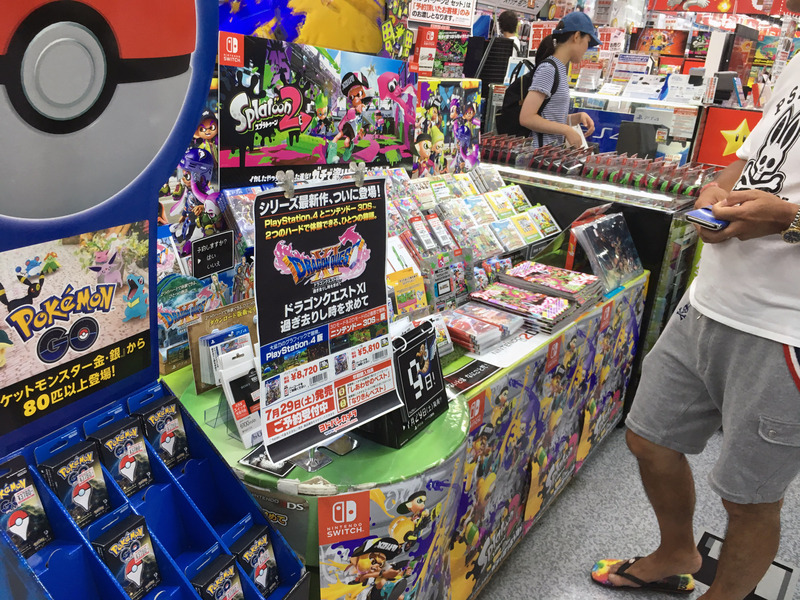 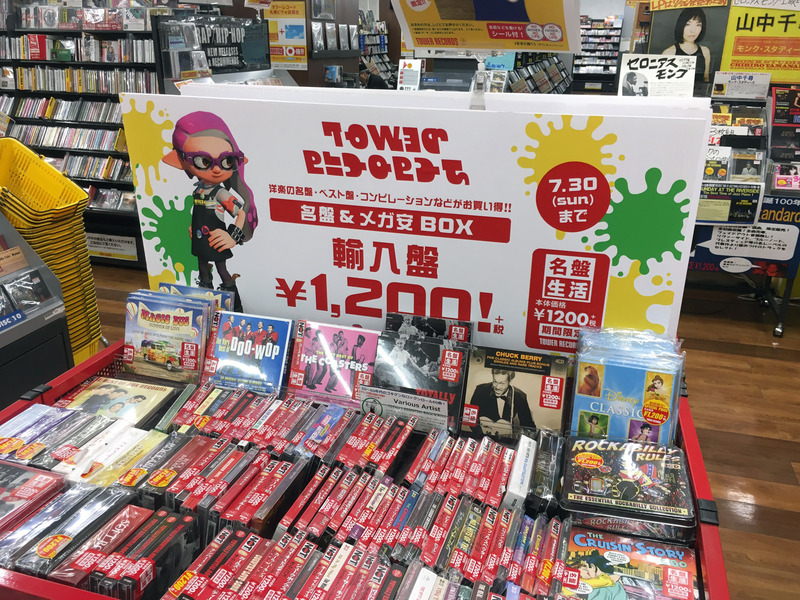 It was a crossover cultural hit with huge merchandising success, and is easily the highest selling home console game in the current generation in Japan, selling more than even huge names on PS4 like Final Fantasy and more recently Dragon Quest. 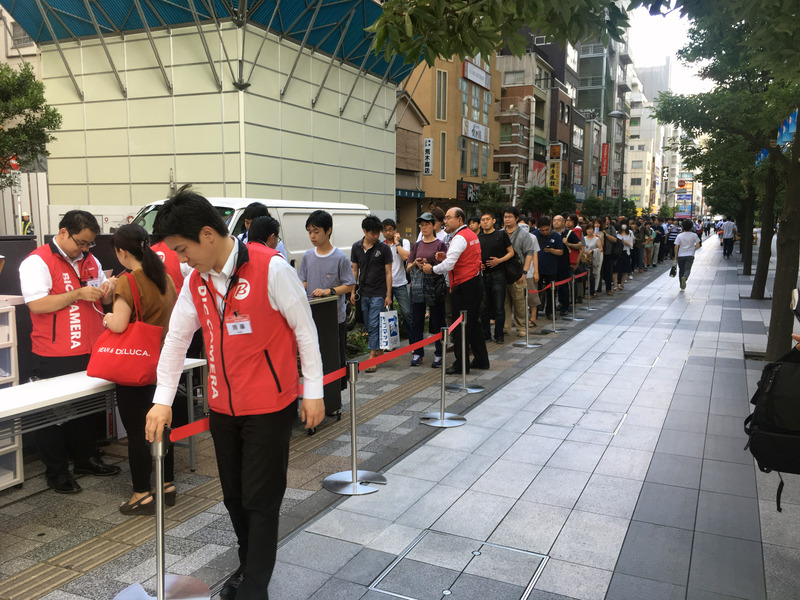 On top of this, Nintendo’s new system, the Switch, is also a huge hit, having been constantly sold out since launch. 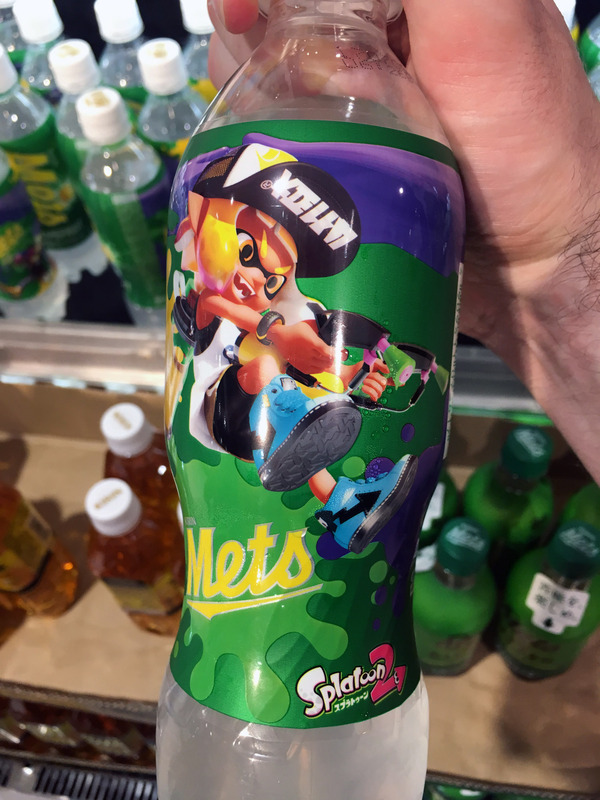 Recently these two things combined with the release of Splatoon 2 on Switch. 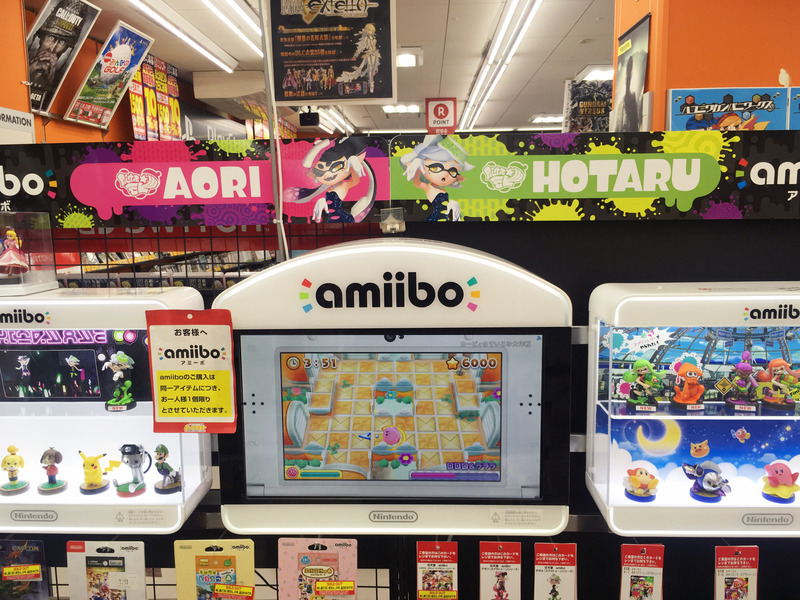 And as expected, Japan has gone crazy for it. 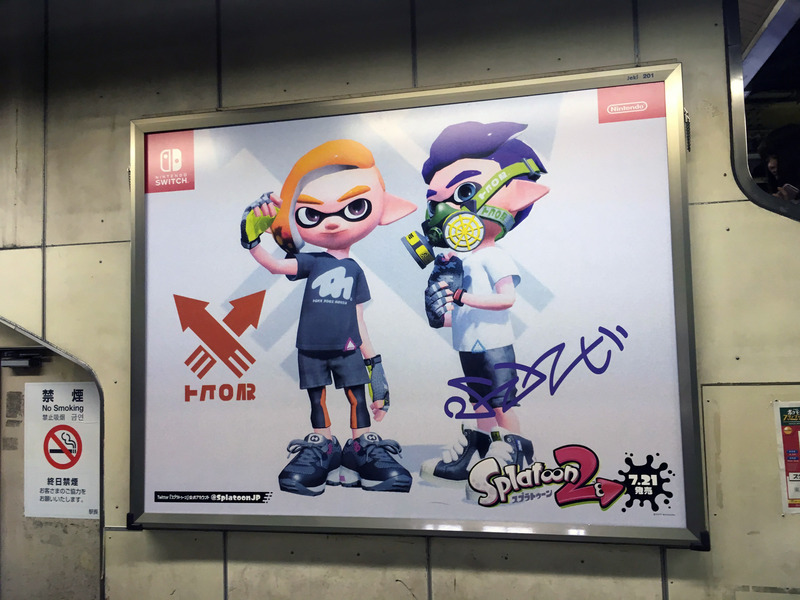 …and standard posters around the city. 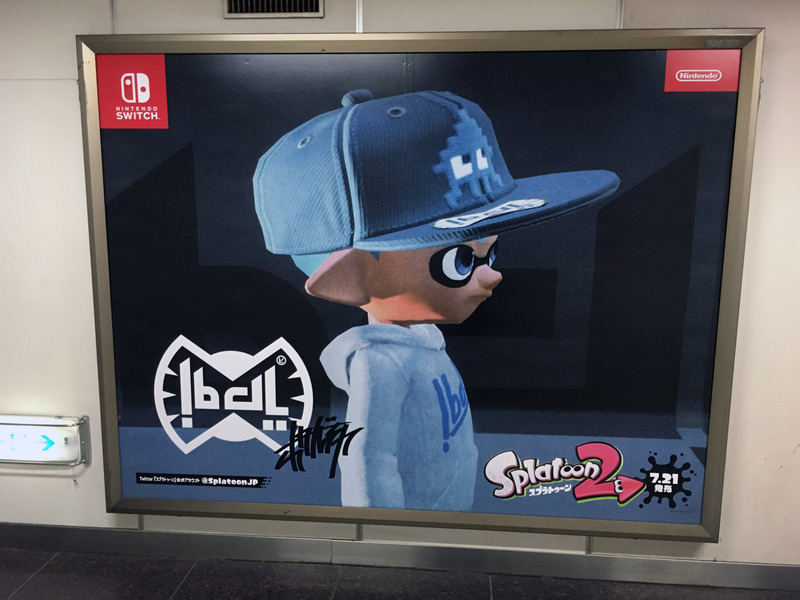 But what sets the Splatoon 2 campaign apart are these: Fashion ads for the in-game brands. 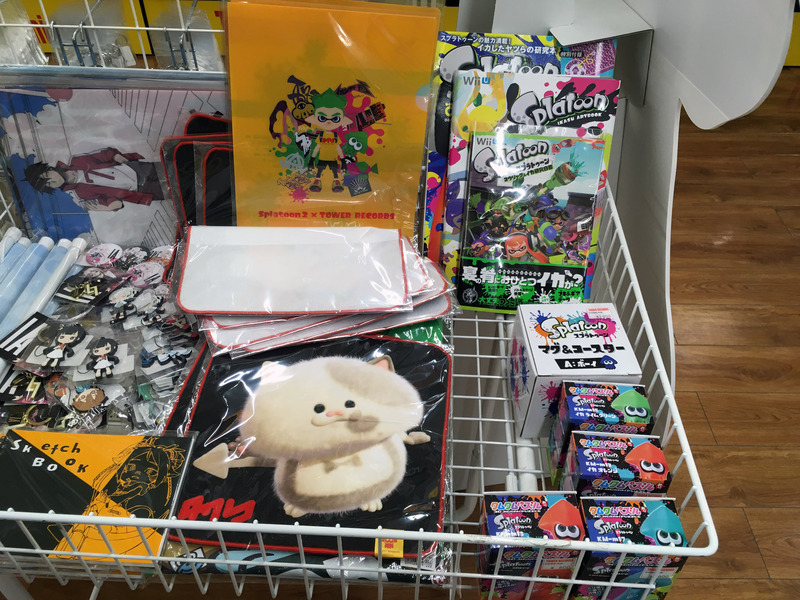 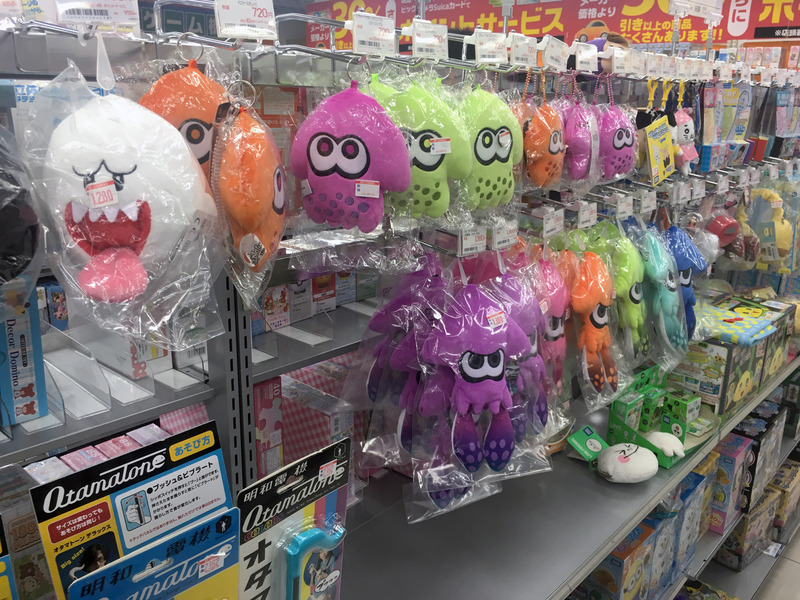 You can’t really go anywhere that sells toys or games or trinkets of any sort without coming across Splatoon merchandise. 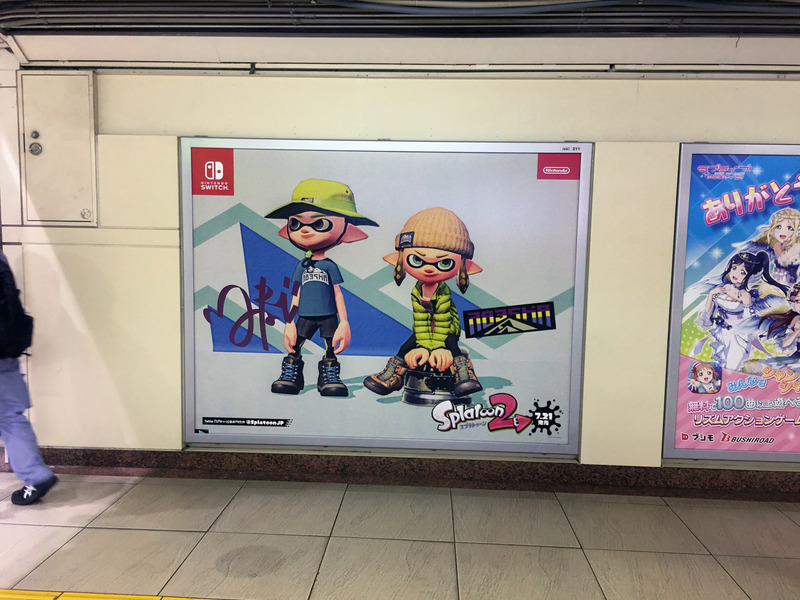 It is everywhere in all cities countrywide. 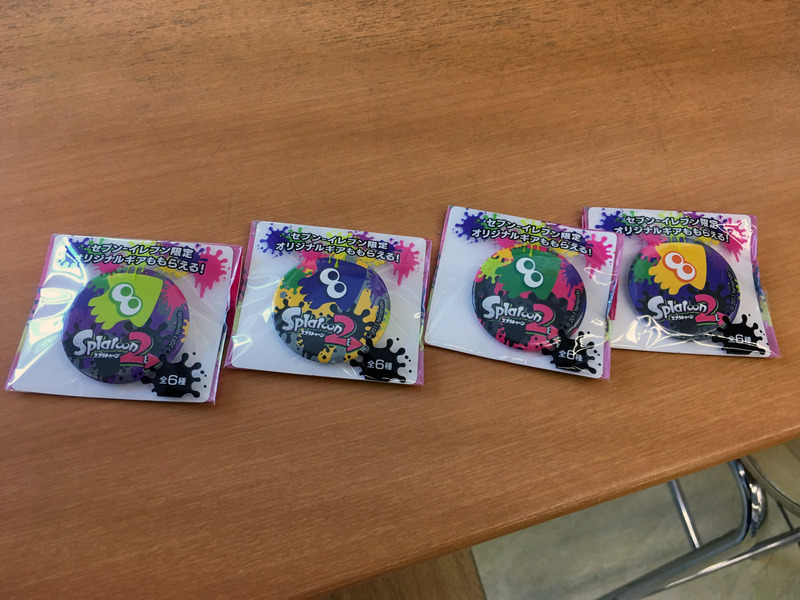 Many companies without a licence are using the ‘rainbow paint’ motif to sell their gaming wares too. 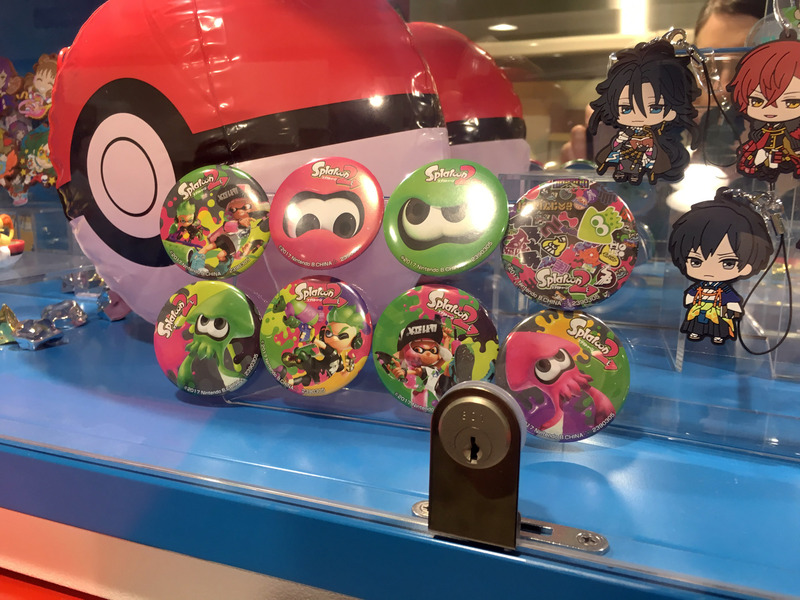 7-Eleven has a promotion to get exclusive in-game gear if you buy the game from them (they sell download code cards) or with certain product purchases. 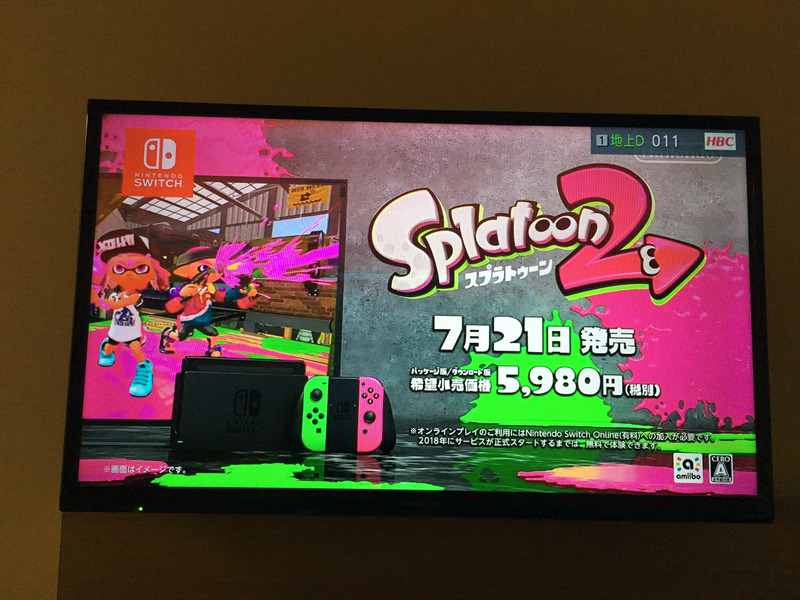 You get a Splatoon badge and a code which can be redeemed on the Switch eShop, and the gear gets dropped off as a package in Inkopolis Square in the game. 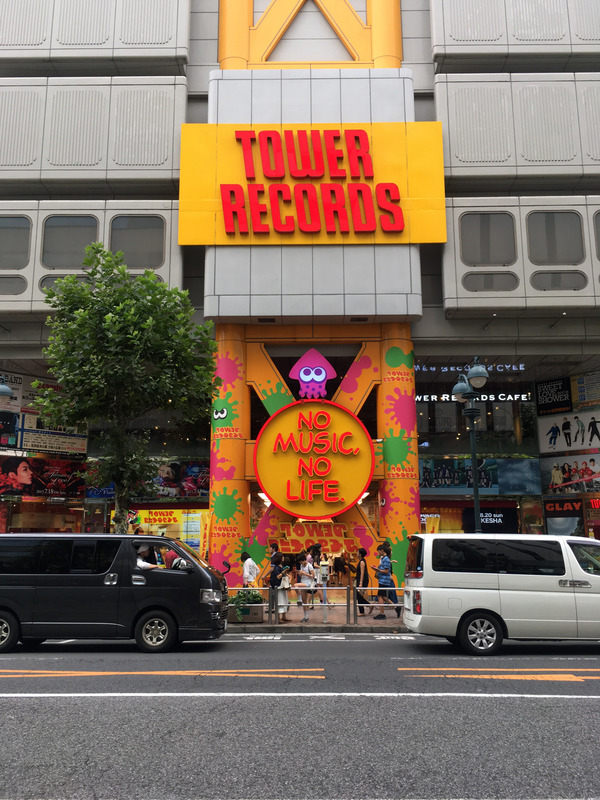 The biggest tie-in with a store is probably Tower Records. 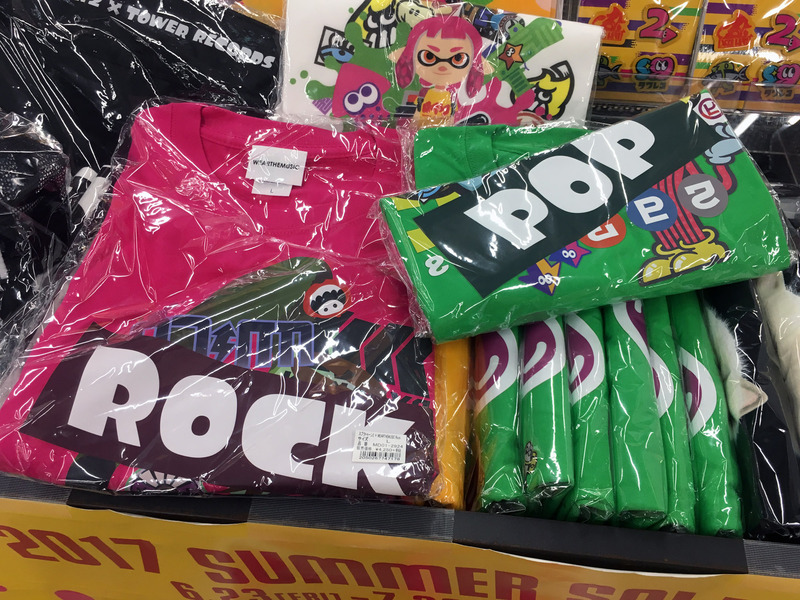 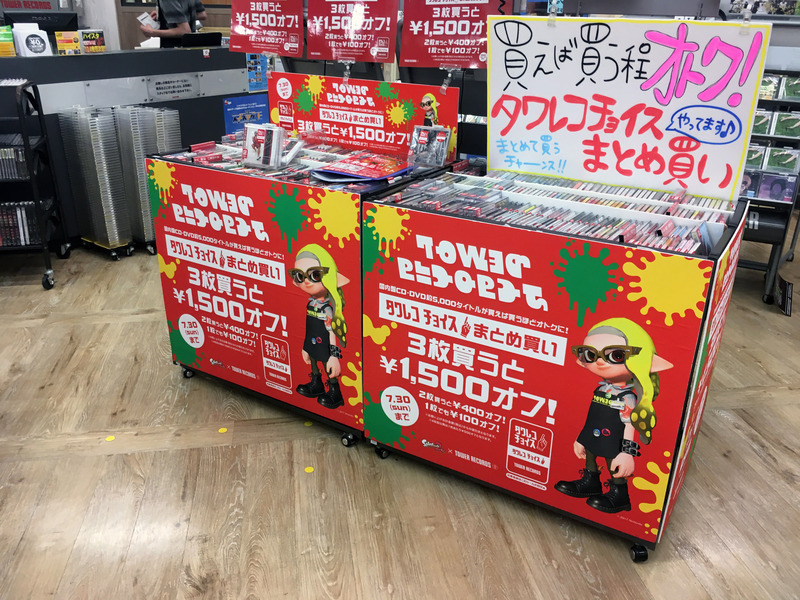 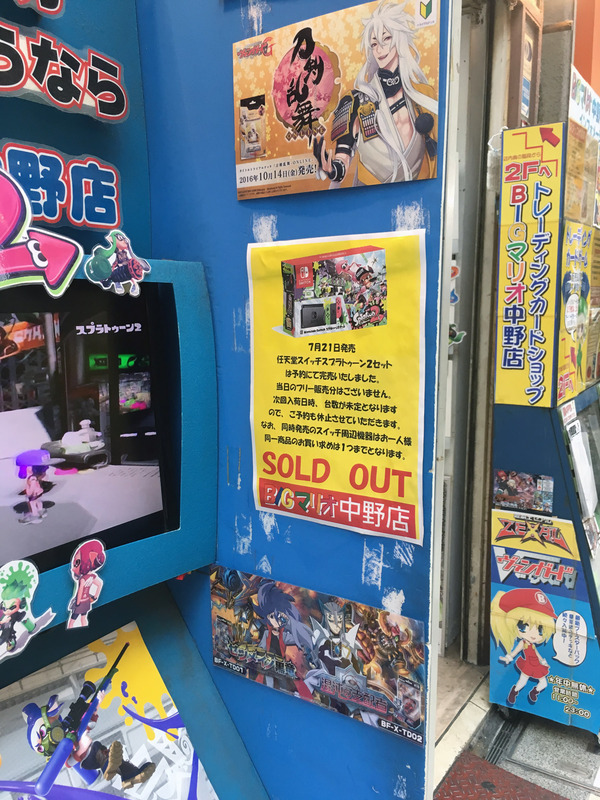 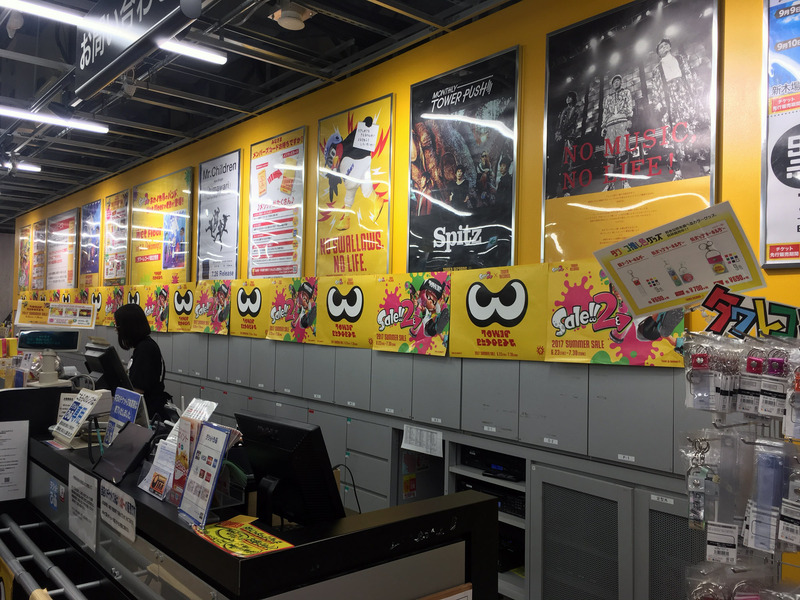 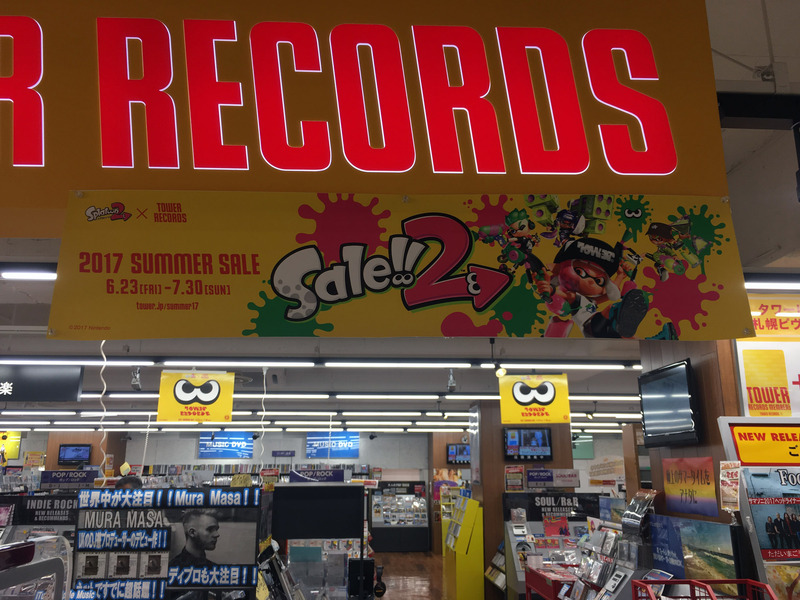 The initial Japanese pre-release Splatoon demo was itself a tie-in, as Tower Records sold the in-game t-shirts for the Rock vs Pop theme. 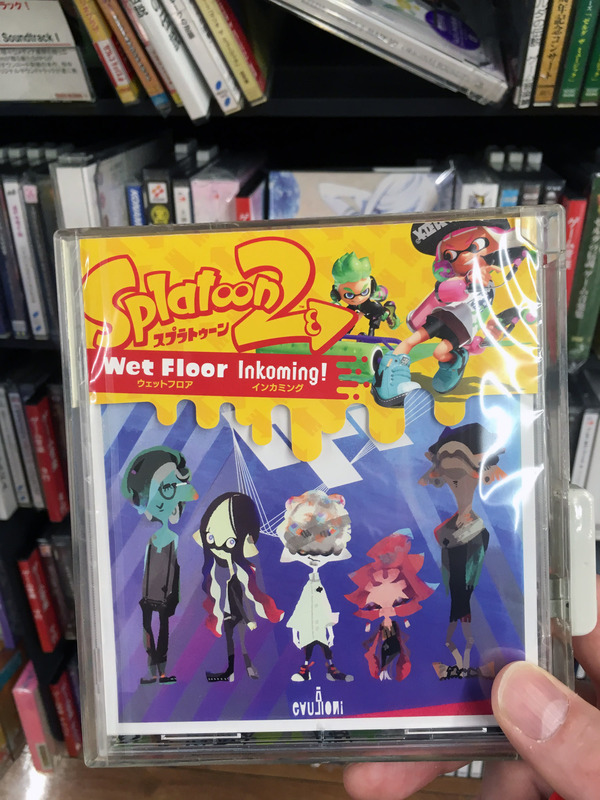 And had a performance tie in with Wet Floor, an in-game band. 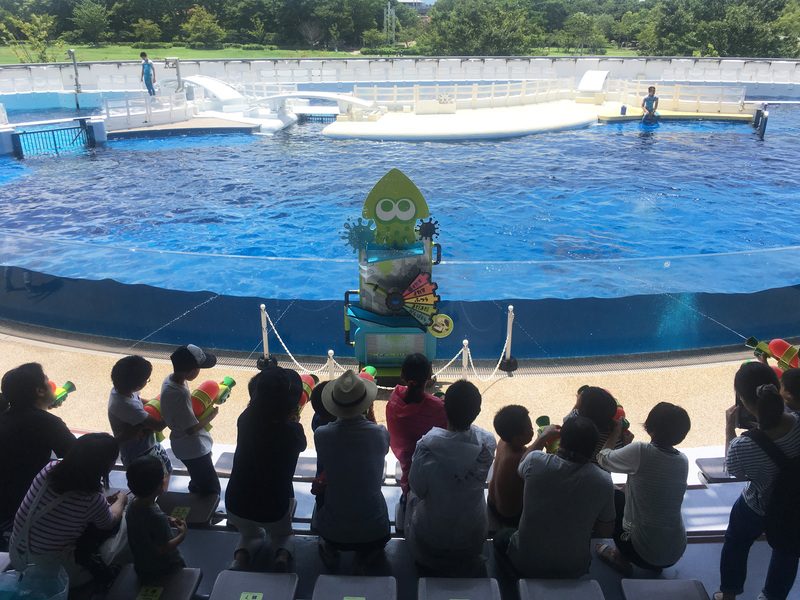 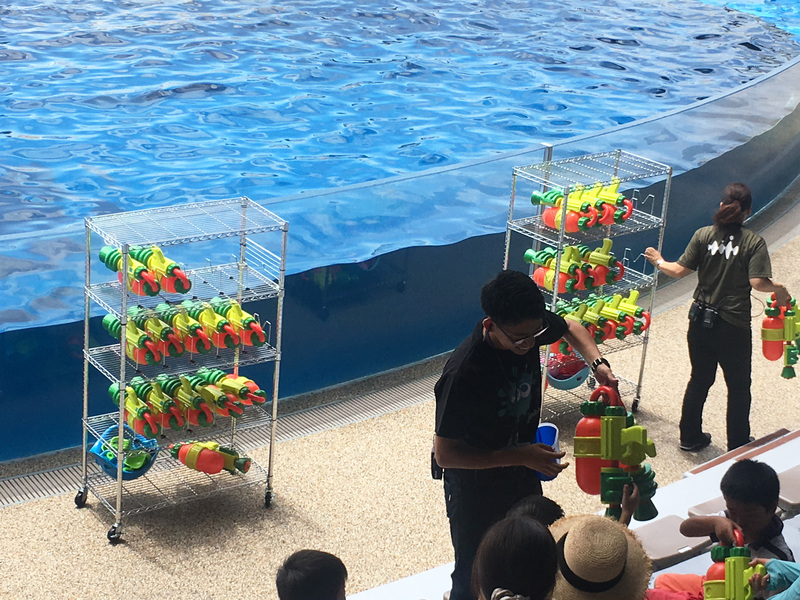 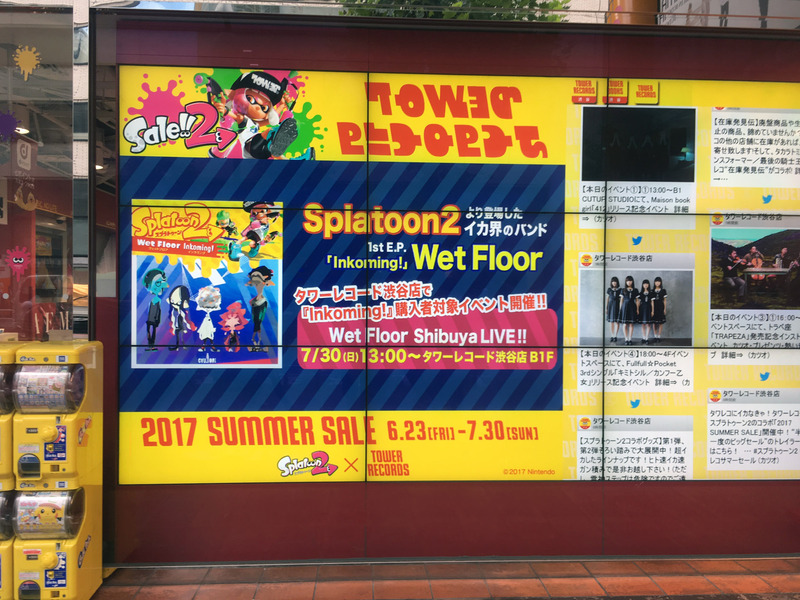 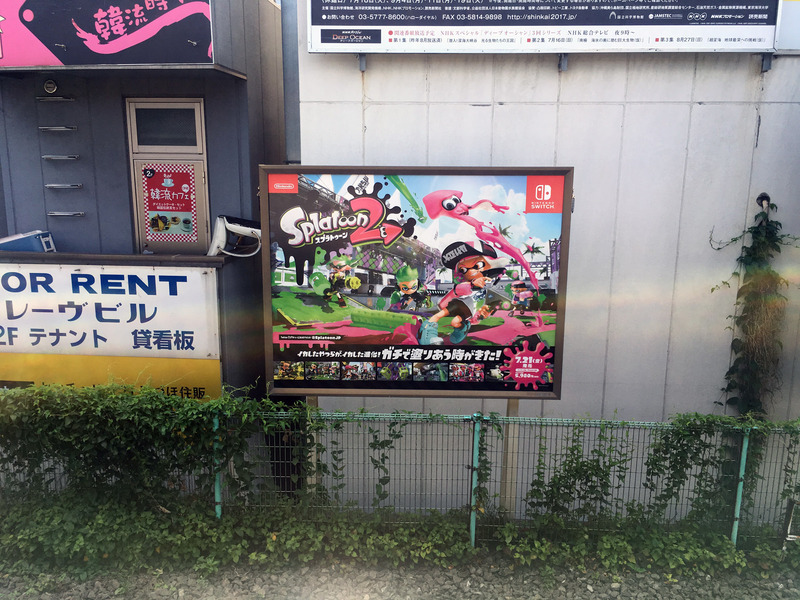 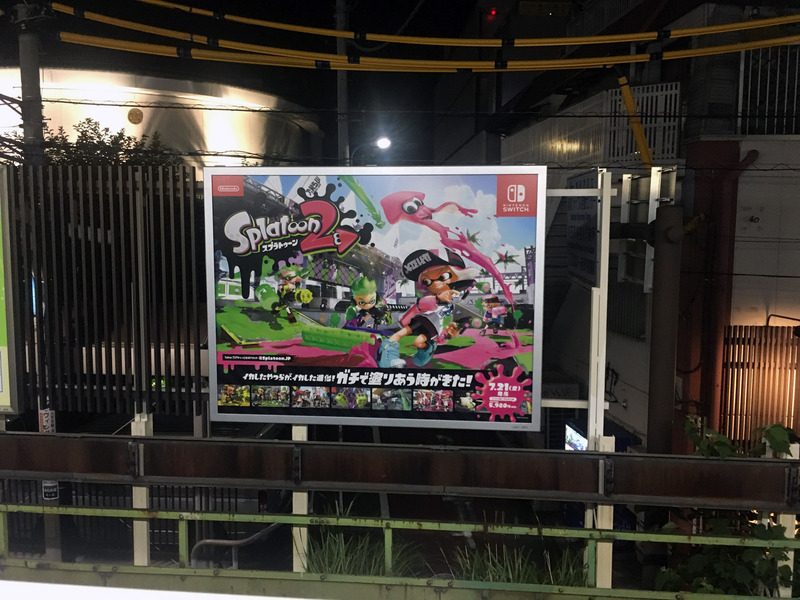 While not nation wide, there is a possibly even larger Splatoon tie-in event with Kyoto Aquarium, which I’ll cover in a future article. 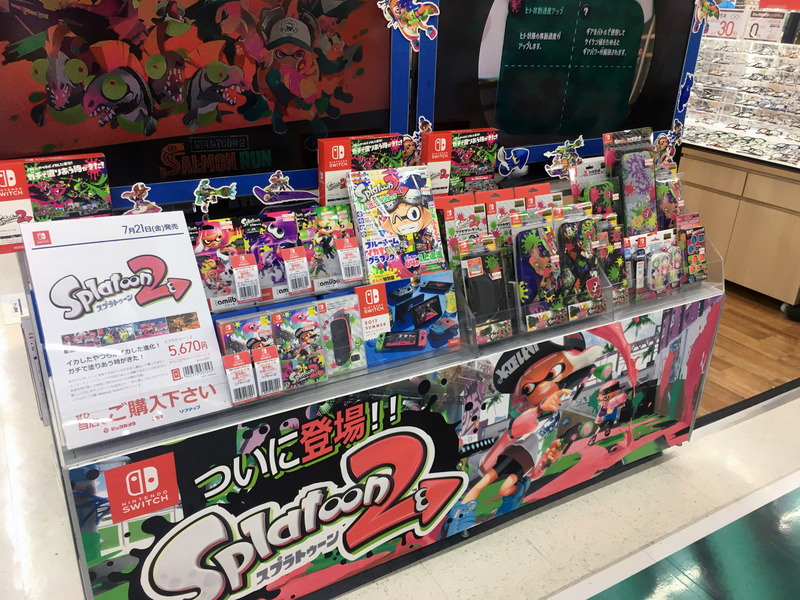 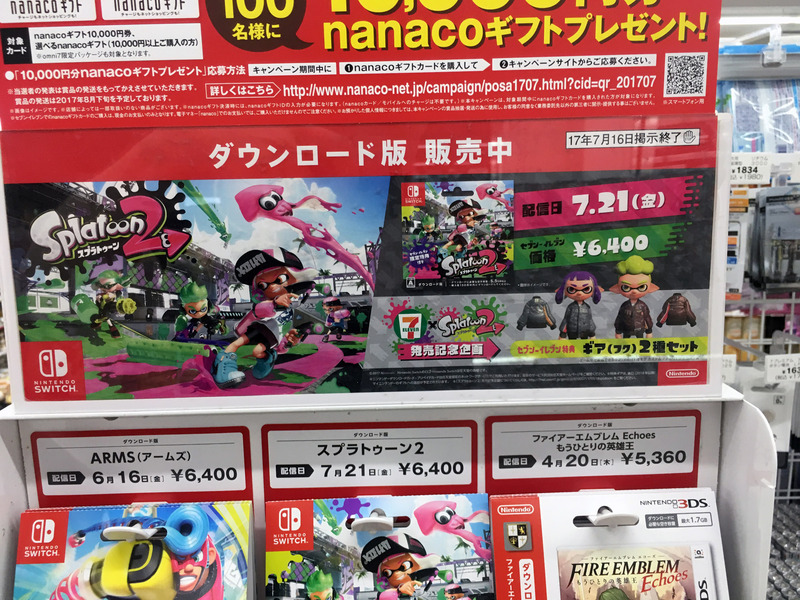 Next article: Splatoon 2 launch day.